A very well attended session tonight! We actually hit almost everything on my to-do list, giving me plenty to do in the coming weeks. Wayne was the first to arrive as usual, and I gave him the task of getting the sub-bus power lines for the area between (and including) Bethel and Branchville. 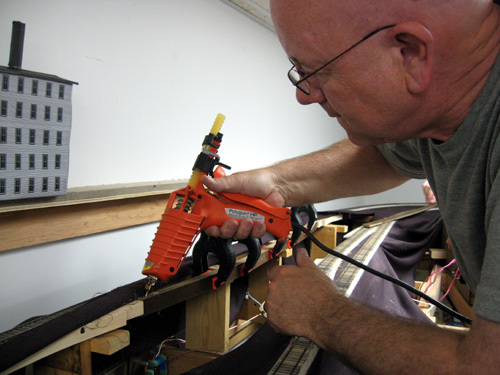 When Dave arrived he worked with Wayne to drill holes in the support brackets and other areas under the layout to string a pair of 12 ga. wires along the 40-50' span. the wires didn't get twisted but that should be OK, I have a plan to twist them up after they are hung (but before the feeders go on). Ray was down, and I gave him a choice between installing decoders in locomotives and building Fast Tracks turnouts. He asked which I needed one more, and the answer was obvious - and so he started building up a pair of #6 turnouts on the workbench. By the end of the evening he had completed them, and this weekend I'll get them installed on the main line in Branchville. That (like everything else) was a big help. Ted P and Tom got to work on the new section of spline through the utility closet. Ted and I had built it last session, and the two of them installed it tonight. Tom provided a section of 3/8" threaded rod and some nuts, which became the supporting mount for the center of the spline. They hung a cleat across a pair of floor joists over head with a nut and washer embedded in it, and supported the spline with another chunk of wood held up with another nut and washer. They reinforced the connecting points at either end where the spline pokes through the wall to make the section rigid and bullet proof. I'm very happy with the job they did. Later on, Dave was helping them over here too, and at the end of the evening we cut and installed a section of 1/2" plywood into the corner to make up the connection from Brookfield Jct. to Danbury. The benchwork around the upper level is slowly but definitely coming together. Ted D (Scary Ted) came up; it was great to see him. It's been a while since he's been in my basement, and we all have a great time when he can make it. 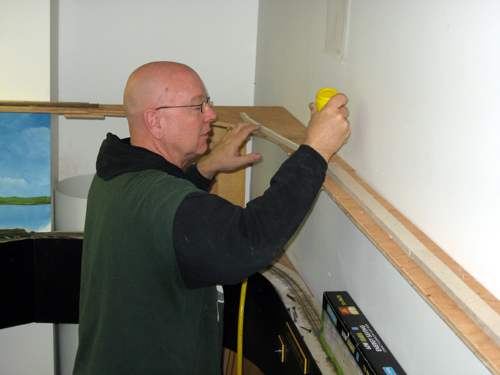 He and I worked on installing flextrack from the stairway wall on the other side of Branchville to the base of Bethel. 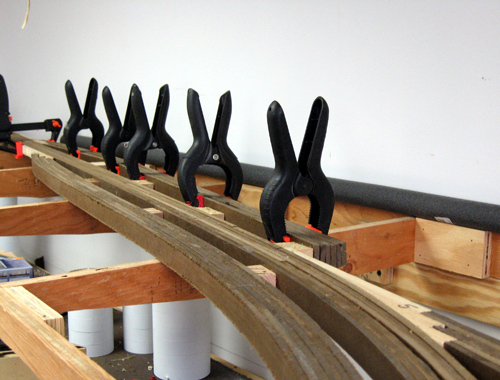 We sanded the homasote roadbed (1/2" strips, kerfed to allow curving) and fit sections of track to them, spread out a layer of caulk on top and set the track into place. We held it down with some push pins, I'll leave them in until the caulk sets up. We went as far as we could, up to the location of the first switch in Bethel. I’m happy with the way it came out, it sure goes down a lot faster than hand-laid track – but I still like the look of the hand-laid better. And speaking of laying track, Neil jumped right in at Branchville, picking up where I left off last week with laying rail down. I barely saw him all night, buy by quitting time he managed to install another 6-8 feet of rail along the main line and siding through town. Now we are really getting to the point where we need more turnouts to complete the trackwork around the place! I suppose I will need to set aside an hour or two every night to work on building turnouts. Otherwise it will be a log time until we can finish up these sections! I got to spend a few very enjoyable hours in the basement today. Spent the time putting in about 8 feet of rail and switches in Branchville, it was a nice reminder how satisfying spiking down rail can be when you are in the right mood for it. I had the ball game playing on the radio, and after that some nice music, and 4 hours just slipped by as I leisurely worked on getting the track laid down. I hope to get back to it soon, but I really need to make more turnouts on the workbench first because I’ve used up my small reserve of Fast Tracks #5’s and 6’s now. I knew I would not get much help tonight because a friend was having a weekday operating session, but I was glad to have Ted Pamperin show up. 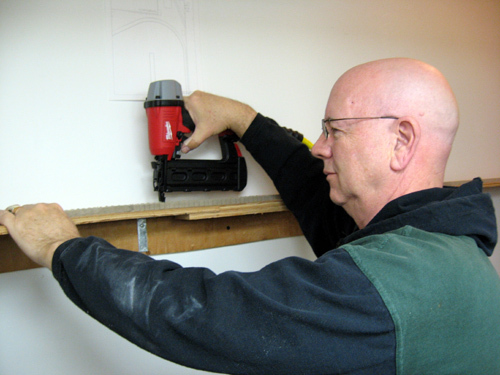 We talked a bit about the different projects that could be done, and decided the best one to work on would be the spline through the utility closet since that was not a one-man job. We got started right away, and Ted had some really good ideas that we incorporated right into the job. We found the span to be only about 7'-6", so we left one masonite center spline the full 8' and let 3" hang through the wall at each end. We marked the center spline where it hit the walls and then cut all the other 5 to that length. We supported the center with some string so it was level (hung from the furnace's exhaust pipe) and sistered up one of the inside splines to the center spline, and secured one end with a few spring clamps. 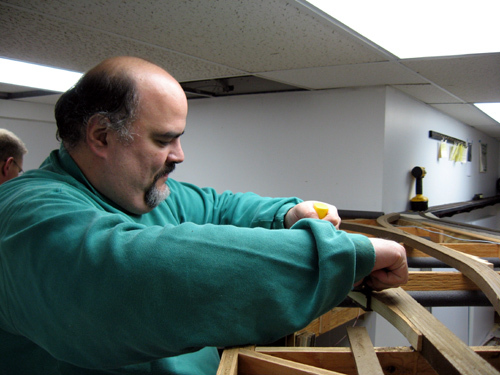 We then hot-glued the second spline to the center spline on the free end, and when that set up we pulled oof the clamps and did the other side, at all times holding the splines in the position we wanted them to be, bending back to clear around the water and gas pipes in the closet. 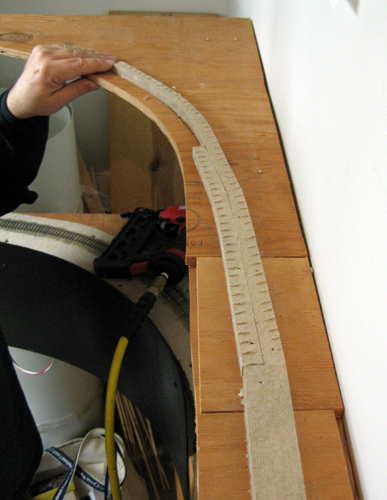 After attaching a third spline on the front, the half-built roadbed was supporting the shape we had set into it. So we took the whole assembly out and placed it across a couple of storage carts, and laminated on the last three splines out where it was much easier to do. It was Ted's idea to do most of the work outside of the closet and drop the finished asembly in place when it was finished, and it was a great idea. We quickly leveled out the top with my belt sander, and then glued homasote roadbed to the top, securing it with white glue and brad nails. Ted suggested extending the roadbed and track bast the ends of the assembly so we could more easily make the final attachments to the connecting track, and I thought that was a good idea, so we extended the roadbed about 4" and when we started putting down flextrack we extended that another 3-4" bast the roadbed. The flextrack was secured with adhesive caulk, and taped to the spline about every 10" to hold it in place while the caulk dried. That was about where we left off for the night. After Ted left I decided to finish up working on my Grassinator. The caulk I had used to hold the wire screen onto the Rubbermaid lid failed (nothing sticks to that plastic), so instead I fired up the soldering iron and melted the wire screen into the plastic lid. Took about 10 minutes to do it carefully but it worked great, when I was done the screen was embedded in the lid and not coming out. It was too late to test it, but I plugged it in and foolishly touched the screen – and got a mild shock for my trouble. It did make the sawdust dance around on the workbench though – I think it is going to work out well. Hope to try it out tonight. 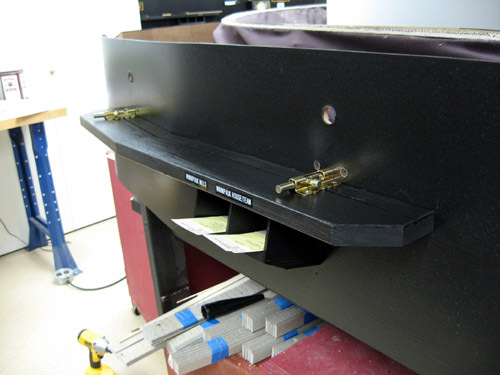 This week I'll get the track feeder wires soldered on, and get the brackets for the edge guards ready to install. and then next session we'll finish the job and drop the spline in place, ready to hook up to tracks and benchwork on either side of the utility closet. Got some work in on the railroad tonight, I dragged myself down to the basement to prepare for tomorrow's work session. I had a really good time once I got started - setting in the remainder of the ties around Branchville, putting in the tie strips for the turnouts and sanding them flat. It was really enjoyable to do, and broke me out of a long funk where I haven't been doing anything downstairs, and feeling guilty about it. So tonight I tore myself away from World of Warcraft (we hade a huge electrical storm anyway) and I managed to get some things accomplished and make myself feel better too. A solid 10-12 feet of roadbed is now ready for laying rail down on, including two Fast Tracks turnouts. I don't know if anyone will do that tomorrow, but at least I can say I got something important done between sessions this week. Had some interesting discussions this weekend while attending several op sessions at friends' layouts. Up until now when operating, we have only operated a 9-10-hour 'daytime' session from about 6 am to 3 pm or so. Part of that was because I was primarily concerned in the begining with modeling the early rush hour passenger traffic, and then the heavy 'through' traffic to and from the carfloats as well as the daytime local freights. And all of that has been enough to really fill in enough traffic to keep everyone pretty busy through a 3-4 hour session, so far. But for a while now I have had it in mind to develop a second afternoon / evening session that would cover the second rush hour from Wilson Point north, and whatever traffic would be covered in the time after that. But a big question was always what that other traffic would be? I mean what was the likelyhood that there would have been more carfloat traffic around and after dusk? The local jobs all run during the day (for now), so what other work can be scheduled to be done in the evening hours? So I and some of my friends discussed that while we had time to. First, we will soon have the opportunity to run more and more coal trains north from Wilson Point, and pring empties back to Dock Yard. Most of these coal extra trains can be run in the second session, like two of the three of them. There is also an opportunity to run some other type of bulk train from the dock at Wilson Point, something like lumber or cotton, or both. So there are some major trains that can run in the second session. Some other ideas came up too for additional movements. We have for some time planned to run a 'Sweeper', a local train from Danbury to Dock Yard and back again, to handle late cars or hot pickups. We've never gotten around to running it, the session usually ends before it get to it. Part of that was because I was not really sure how to run it. The local trains usually handle all of the regular switching using the car cards, so what would the Sweeper have left to do? The answer to that came from Tony Koester's Nickel Plate Third Sub layout, while we were talking about Cayuga, Indiana and pickup cars for local trains other than those at the C&IL interchange. It occurred to me the situation was similar, and that the way to handle it was to provide the Sweeper crews with a switch list that would call out pickups and setouts of specific cars to handle at each station. The layout owner (me) would select a few cars here and there between sessions to get special handling in the off-hours session, and the train crew would have to work from that list rather than just go by the regular waybills in the cars. So that provides an opportunity for some local switching during the second session. Other opportunities might include deadhead extra passenger movements to get equipment back to where it needs to be for the morning rush hour again, and it would probably also be possible to complicate things by sending out a work train to take a siding on the railroad out of service during the off-hours. And finally, as I think about all these things today I think it might make sense to change the local turn jobs into second-session evening jobs. It makes more sense - just like today serving the industries is probably best done overnight so their deliveries are in place first thing in the morning, and the previous day's work is now on its way. Also a good time to run the drag freights without getting too much in the way. This would push the majority of through freights / carfloat jobs - and the Sweeper - into the daylight hours between the rush hours, where it makes more sense. I think this would help balance the activity between the sessions and provide enough activity for both - as well as make them different, which would be good. I need to discuss all of this with my crew to see how they feel about this, but I think they will support the ideas because it will promote diverse activity. And in time, when the upper level is opened up and Danbury as well down the road, there will be even more train operating opportunities. Switching jobs, yard jobs, transfers between railroads. There will be a lot to do in either session. Good session tonight, concentrating on Branchville. Wayne arrived a little early, I was glad to see he was feeling well tonight. After some small talk I asked him to make tie strips so we could start getting the roadbed in Branchville ready for rail. As he started that up, Tom arrived and he and I got to work on finishing up the rest of the roadbed in and around Branchville, the parts that hadn't been finished before. First we laid in the long sections of roadbed, completing all the bare subroadbed in town, and then we cut and fit triangular sections in to fill the spots left where turnouts had to be located. I will still have to go and shim some of these areas with cardstock to make them flat before we can go and glue in the ties for the turnouts. It occurred to me after we were done that when Neil had been doing this months ago, he put in the shims before gluing the roadbed down, which was a better idea. Oh well, no big deal. Ray arrived shortly after the others, and I guess it was his turn not to be feeling well, but it was nice that he showed up. He kept the conversation lively as the rest of us worked. 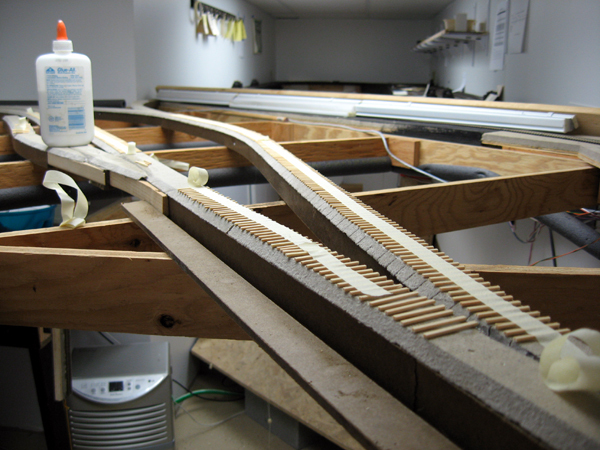 After Tom and I were done putting in the rest of the roadbed, we started gluing in the tie strips Wayne had been making all night. We managed to get in a few until Tom and Wayne both started feeling tired, and headed home. Ray stuck around a while though, and we decided to give the new pneumatic grass applicator gun I built a shot. 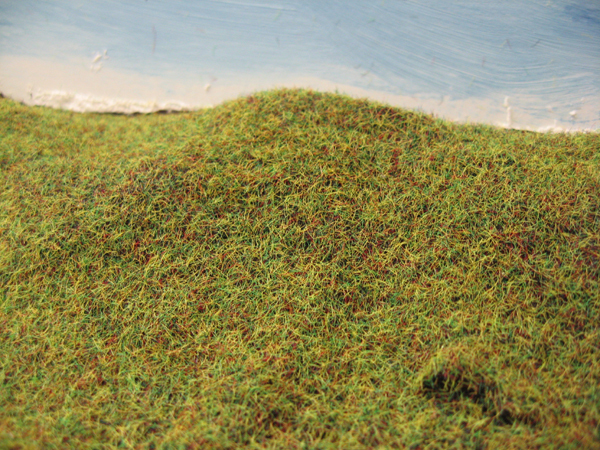 My order of static grass from Scenic Express came in a day or two before, so all the materials were finally present. 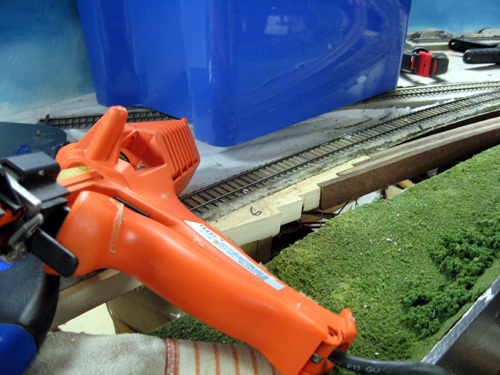 As I loaded up the gun with static grass, Ray spread dirt-colored paint on a section of the layout that had hardshell but nothing else. We flipped on the compressor, and I pulled the trigger! Well, it was not as impressive as I had hoped it would be. It did make it fast and easy to apply the grass, and it was highly controllable, only requiring a bit of shaking to get the fibers airborne in the bottle. The grass fibers stuck to the insides of the bottle quite well, so it seemed to work properly, generating static as the instructions said. But once the fibers left the gun they seemed to lose any charge and only stood up a little bit once they hit the paint. I may try a few other things - extending the outlet pipe inside the bottle so the fibers have to be blown around more to be blown out. Higher air pressure. Maybe even a different type of bottle or jar - The original seemed to have been made from a polypropylene / polyethylene type of container (translucent soft plastic), I'll try to find one like it. I could try holding the gun closer, maybe I had it too far away for the static to attract the fibers. On the whole, though, it wasn't a great success. The results were a little better than if I had just sprinkled them on. It looked all right, but I think an electric static gun would work better. Update: After he got home, Ray found another do-it-yourself static grass tool plan on the internet, this one electrical - and once again I have many of the parts in stock already. It looks like after the few bits I need to buy/order for around $20-25, I can make an applicator that should be every bit as good as the professionally made one. The key part is called a negative ion generator, which is surely what the heart of the pro tool is. Fortunately the article recommends an internet source, where I found a 120v version of it selling on sale at $8 apiece (plus $8 shipping). So I immediately ordered one. I can't wait until it arrives next week! We have another work session this Friday, I hope to get some of the remaining upper-level benchwork completed then. A quiet session tonight - nobody showed up. Well, no one from the regular crew, anyway. Chris Theis from St. Louis, who was out here for work, stopped by after I had invited him earlier in the week. We spent some time touring the layout and then we did a bit of work. Picking up where Dave had left off in Bethel, we installed homasote roadbed all the way up to the end of the current benchwork by the base of the Danbury peninsula. It was nice having some company for the evening, and Chris was a very helpful guest! I'm about ready now to start laying in some track from Branchville out through Bethel. 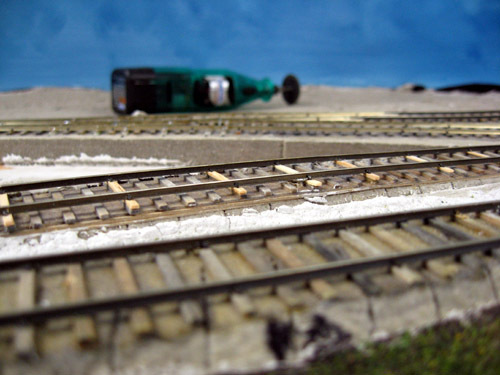 I admit layout progress has been suffering a bit as I try to get some projects for my fledgeling model train business going, you will be hearing about it very shortly. I've been working on some 1870-1890's models for sale soon, with better detail and professionally cast. These models are really going to shine, the best work I've done yet - and very soon you'll be able to have them as well. For a sneak preview, please check out www.AmesvilleShops.com to see what the first few models will be! And more will be coming as this year moves along. Spent some time today trying to make up a list of projects that need to be done to finish the upper-level loop around the basement to get the upper level in and running. The big things are to pit in benchwork for Brookfield Junction, and finish the benchwork between there and Danbury, including the section that goes through the utility closet. I have enough elevation going through the utility room that the track goes over the water heater and furnace. I'm trying to decide now if I should go more or less straight across the closet, or if I should try to dive back behind the water and gas pipes supplying the appliances. Going straight over is easier, but the section might have to be removed if an appliance needs to be raplaced, and the water heater is nearly 16 years old already. It makes more sense to go behind, but it is harder work and makes more of a mess of the walls next to the closet. Oh well, it's probably better to do it the hard way and not regret it later. If I can get these sections of benchwork built, I can start having the other guys do things like get the wiring and track in over the next few months. It would really be nice to get the upper level running, even if most of the upper-level industry tracks won't be in for a while yet. Wayne was the first to arrive for tonight's session, and he and I started off putting up edge bracing on the new Bethel benchwork. This was made from some 2" battens I had cut out of 3/4" plywood, with a 1/2" wide by 3/8" deep groove cut into one side about 1/2" in from the edge. This edging was glued and screwed to the 1/2" plywood we had already hung, and captured the edge of the horizontal panels inside the groove. This had the desirable effect of aligning all the edges of the cantilevered plywood benchwork without having to have any splice plates across the bottom faces. Wayne and I had this up in about 20-30 minutes. Tom arrived shortly after we had started, and so did Ted Pamperin. I asked them to work on getting more of the backdrops hung along the back side of the peninsula, past where the creamery and ice house in Wilton will go and over to the electrical box in the corner. They had to put up some new splines along the upper-level supports to hold up the styrene backdrops, which took a fair bit of time, and then they started to hang the styrene panels on that. It wasn't very easy because I'm using 1/8" styrene for the panels now, and it is a lot heavier than the .060" stuff we were using previously. Twice as heavy. But they managed to get about 12 feet of it hung last night, which was great. Next session we'll be able to complete the curve at the pninsula base and go into the back corner of the room with it. Dave arrived a bit later, and I asked him to move the Wilson Point fast clock panel to the other side of the scene, where the road crews will be able to see it better. 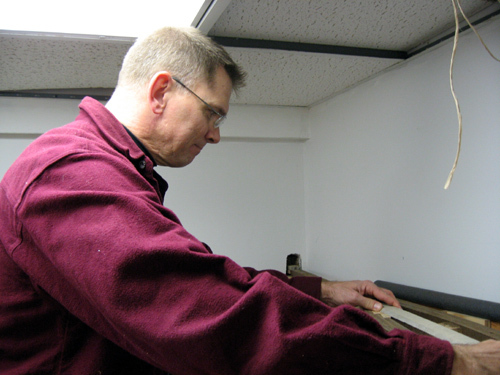 We drilled a 1/2" hole for the control cable to pass thru, and then Dave mounted the panel to the fascia. Eventually I'll put up a larger fast clock on the stairwell wall where crews from both Dock Yard and Wilson Point ca see it easily so the Yardmasters won't be left out in the cold. 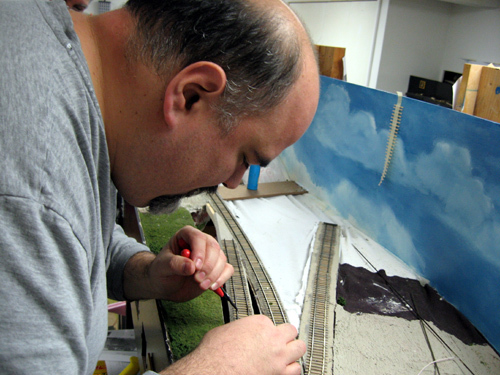 After that, Dave got to work putting in the homasote roadbed through the Bethel scene, using up all that I had cut. If I'd had more prepared he could have done the whole scene to the foot of Danbury, I think. We decided to knock off a bit early, and had some discussions about how to proceed with the upper level. No one has been looking forward to trying to hand-lay track on the upper level, including myself. A while back Ted Pamperin had suggested that we might use Micro-Engineering flextrack up there with the ties doctored up to more closely resemble the tie size and spacing of the 19th century hand-laid track we had put down on the lower level. We talked about the tie spacing, and Ted said if we cut the small plastic bits under the rails here and there we could remove every tenth to fifteenth tie and spread the rest out to more closely resemble the 24" spacing I have everywhere else. We compared the ME flex (I had some around, intended to be used for hidden areas) to the track we had already put down, and saw that the tie spacing is closer but it is not a big difference. We decided that it is the upper level, and most of us won't have a very high viewing angle on the scene even standing on a stool. The closer spacing would not be very obvious, especially once it is all ballasted. And using flex would allow us to make much faster progress on getting the upper level 'tracked up' and ready to operate. So I think a decision has been made here to go with code 60 micro-engineering flextrack through most of the upper level. 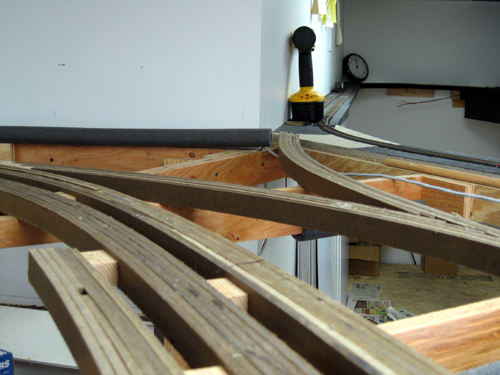 We'll stil use Fast Tracks turnouts all through the layout where possible and we'll have to integrate those carefully with the flex, but I don't think that will be too bad. Had a nice surprise when I talked to Ray Louis tonight, who wanted to come over. He had wanted to come to the work session last night but work held him up. Ray and I have been talking about tuning up the steam locos on the layout in the last few months, and he had some things he wanted to try out. Who was I to say no? One thing we were going to try was better axle wiper power pickups that the ones provided with the original Spectrum 4-6-0 locos. These first models look great but have always been somewhat balky on anything but perfectly laid track. The later Spectrum 4-4-0 models have three wipers per axle for better contact, where the 4-6-0's have only one. I thought I had some phosphor bronze sheet metal around, but I couldn't find it, so we had to settle for using the as-delivered wipers. I took them and the bronze washers built into the trucks and cleaned them well,though, with a track cleaning bar, and cleaned up the axles at the contact points too. While I was doing that Ray reamed out the axle cups on the plastic tender trucks, which made a big difference in how they rolled. After that he set about to reduce the number of contact points in the power pickup system to the decoder in the tender. He had found numerous contact points in the design where oxidation and poor contact could poorly affect the transfer of power. Ray had brought some super-flexible 29 ga. wire with him and after drilling a couple of holes in the tender floor, he hooked up a couple of strands to the decoder power lines and then hooked them up directly to the bronze power wipers on the trucks. This made for a much more direct connection between the decoder and the track, in addition to the stock power pickup system. Tests after he was done showed the modified model was moving much more smoothly and reliably without stalling than similar ones without the cleaning and extra pickup wires. We were both pleased with the results, and said we would get together in another week or two to set up an assenbly line and make the improvements in all of the Spectrum 4-6-0's. Hopefully by that time I'll have found my phosphor bronze sheets (or bought new ones) and we'll be able to include improved axle wipers for these tenders on top of the additional wiring. We had a good work session tonight, in spite of the fact that I didn't have much planned. It has been a tough week with bad weather, and most of my plans to get things done and materials made fell by the wayside. Still, when Tom came over I figured we would at least get the new Bethel trackplan laid out on the new benchwork. I had hoped to get some edge framing done there, reinforcing the plywood decks we just put up, but the special edge boards I need to mill aren't done yet due to weather conditions. Anyway, while we were discussing it Neil showed up. 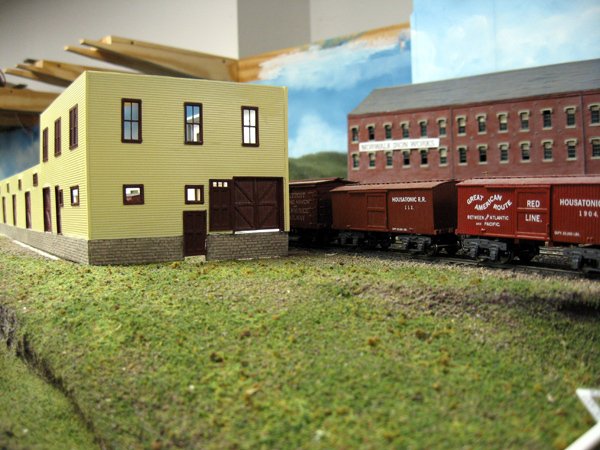 He had in tow the nearly completed model of the South Norwalk Freight House, assembeled painted and even weathered. I am really pleased with the work he did, an awesome job. After looking the new model over for a bit, Neil asked what he could do. We talked about the different projects that had gone on recently and decided it was best if he and I worked together on completing the new Z-bend pusrod installations for all the switch machines and also tuning up the electrical frog switches which needed a bit of adjustment. Tom set to work on plotting out the track centerlines through Bethel, and Neil and I worked on the switches. Most of the switch machines Tom and Dave had done before were perfect, a few needed a bit of adjustment because the pushrods were not out of contact with the frog switches. For the most part, it went quickly - a slight twist on a switch there, a bend in the pushrod here. Naturally, most of the work ends up being on just a couple of switches that are tough to adjust. We ran into one of those at Wilton where the track ducks into the utility room. We practically had to replace the entire custom machine there to fix up the pushrod to get it working again. After that we went to Standard Oil and did all those pushrods which had been missed the first time through. That was a little tougher due to the benchwork there, but we managed to get through it. Dave arrived a little after 8 and got to work with Tom. 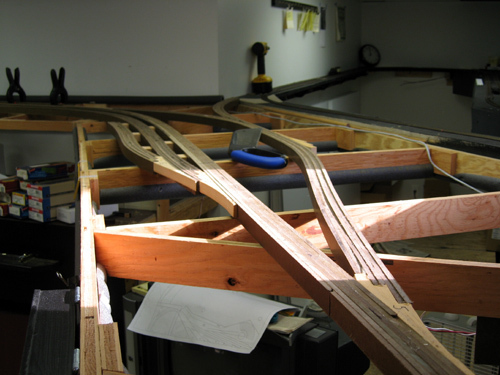 By the end of the evening they had completed the track layout of Bethel, which was complicated by the threaded rods holding up the benchwork. Some adjustments off the plan had to be made to accomodate the obstructions, which I had expected, and Tom and Dave did a fine job in adjusting the plan to meet reality. We are talking about hiding one of the rods in a tall Walthers smokestack, not sure what to do about the other. Both rods are very close to the track, infringing on the right of way but what can you do? Perhaps we can hide the other one partially with a water tank. By the end of the evening we were all four of us discussing the Bethel plan. Everyone agreed it looked like the arrangement would work out well. All the turnouts are located near the edge, and even the rearmost industries should be able to be worked well. We even figured we could use the open spot in the benchwork to our advantage - a coal dealer will be located there, and we can slope down the scenery in that spot to leave some vertical space underneath to show a dump area beneath the building. I'm feeling much better about this area than I did just a few months ago. We also discussed how the new deck was going to affect the scene underneath at South Norwalk. I had mounted some compact fluorescents (CFL) underneath the new deck, and turned them on for the guys. They generally thought it would work out well once the fascia was up to act as a viewblock, but we also figured we'd need some additional shades around the lights between them and the viewer to keep glare from being an issue, which I agreed with. They also said more lights than the four up there were needed, which I also agreed with. 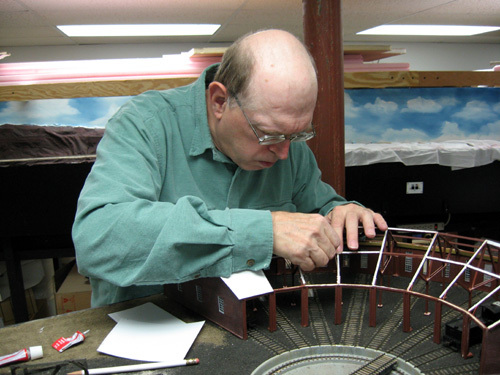 At the end of the night, Neil took the roundhouse with him along with the scalloped roofing tile sheets, and pledged to get the roof done on this model, finally. I will love to see this model get finished, it has been in a state of partial assembly for a long time now. What a thrill it will be to finally have it done! I will need to spend some time working on the Wilson Point station to get it finished too, after which Wilson Point will be very nearly complete scenically (except for a couple of ship models). 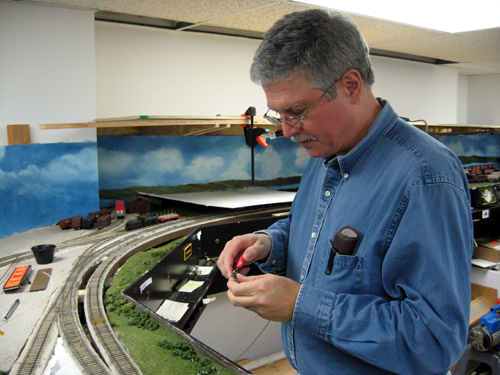 Just returned from a great weekend at the Railroad Prototype Modelers (RPM) meet in Malvern, PA this weekend and had a great time. If you haven't been to one of these meets, I highly suggest going to one if it is within your ability and travel distance. Saw a lot of old friends and made some new ones, attended a number of really good clinics and in general had a ball. And the modeling you'll see at one of these events is just amazing. RPM is all about a non-competitive display of people's modeling from adding detail to stock models all the way to scratch-building. So it draws a different crowd than an NMRA contest-style event will. 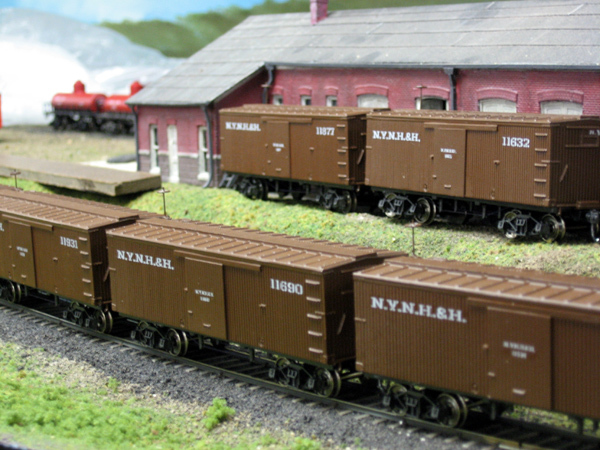 Sadly for me, with all the rolling stock off the layout for shopping right now I had no models to bring, but I'm planning on bringing some of the gondolas and NYC boxcars to the Collinsville RPM meet in June, so maybe some of you can see them there. One great thing about an RPM meet (or an NMRA meet or LDSIG or OpSig meet) is that it usually gets you fired up about working on your own layout, and as usual this one has for me. I'm looking forward to my work session this week, I'm hoping to get some more work done on replacing switch machine pushrods and getting Bethel framed up and to start plunking down some roadbed on it. Last session we discussed the idea on suspending operations for several months while we get the upper-level trackage around the perimeter of the room built and operational, and there seemed to be a lot of support for that among the crew. I'm working on devising a project plan to start moving in that direction. There will be a lot of work to do on the layout for the next several months! A small but very productive session tonight. Just three of us - Tom, Ted P and myself, but we were able to accomplish a lot between us. Now that most of the adjusting work in Dock Yard is done, it was time to move on to doing some more construction. 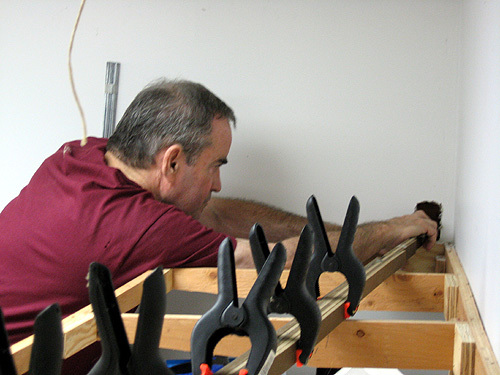 A few months back, Ted, Tom and I had cut out the basic parts for the Bethel benchwork that will sit perched over South Norwalk, and Tom had provided the hardware we would need to install it. So I felt tonight was a good night to move forward with that. When I decided a few months back to move the town of Bethel about 15 feet to the south away from the Dock Yard working area, we all knew right off we would have to support the front edge from the ceiling above. Tonight would be the night that the benchwork for this part of the layout would finally get hung. We took a few minutes to discuss what had to be done, and the guys liked my idea of including a supporting beam underneath the plywood sections as an additional and continuous support. We moved the ceiling tiles out of the way and got started hanging the mounting hardware on the floor joists above. We bolted the hangers to the joists, then slipped in 3/8" threaded rods and capped them with nuts. Tom had bored out the hangers so the rods would slip through, making adjustments from the top much simpler. 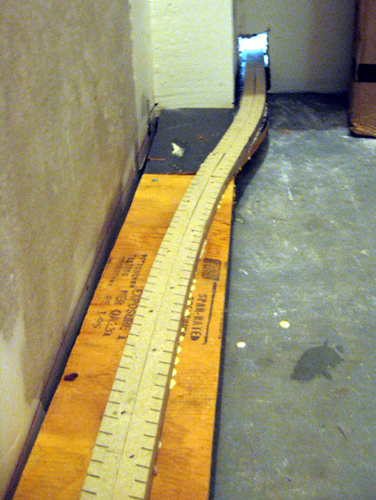 Knowing (and measuring) confirmed the joists were 48" apart and 15" out from the wall, so we cut the plywood 1x3 batten I'd been saving for this down to seven feet, measured in 16" and drilled the first hole, then the second one 48" down the line. We slipped the batten up onto the threaded rods and screwed on a pair of flanges to the bottoms of the rods, and had a hanging batten. From there we figured out the distance from the right side rod to the end of the existing benchwork and translated that measurement into a hole in the large plywood section, which then got threaded onto the rod followed by the batten and the flange, and things started to take shape. We completed most of the Bethel benchwork by fitting in an offcut from some of the Danbury benchwork that fit into place in the gap that was left, leaving a hole in the back that can be filled later when necessary, if ever. We finished the night with a discussion of what we should concentrate on during the next few months. We agreed that it made sense to try and complete the benchwork and track around the walls of the upper deck (skipping Danbury for now) and get most of the upper level installed and operational (meaning benchwork, track and electrical). Danbury, being a series of very complicated modules, can start getting built offline up in the garage the way we built Dock Yard, then brought down in sections and stitched together. That will keep the major construction away from the layout and allow us to work on and operate the layout right up until Danbury is done and ready to be cut into the main line. So chances are we will be foregoing operating sessions thru the summer months to let us concentrate on finishing threading the main line around the walls of the upper deck. Neil came by tonight and we continued working on troubleshooting Dock Yard. Neil had said earlier in the week how difficult it must be to try and do this working alone, since it is really tough to see what is going on on top of the layout while you are underneath trying to adjust things. He pledged to help me work through the problems we still had at Dock, and he is making good on that offer. We spent about 2 hours tonight working on problems all over the yard, quickly finding and isolating the causes of certain issues, then getting them fixed quickly and moving on to the next. I think we found and fixed about 10 or 12 separate problems in that time, and now the yard is working much better. There are still a couple of problems I have to see to including a couple of dips (low rails) to shim up, but when that is done I think we will be really close to having the yard no longer be a chronic problem. I am continuing my campaign to replace the straight pushrods which ones that have spring bends in them. Neil and I did a few tonight as part of the changes we were making, but I still need to do a lot more of them. I am hoping to get that task done later this week. I noticed after Neil left that some of the turnouts Dave and Tom worked on need the microswitches controlling the frog polarity adjusted. A lof of then either got knocked out of alignment, or the new pushrods simply don't put the same force on them. That will be an easy adjustment, and I'm sure I'll have them fixed by the end of next week. The same issue happened under Dock when I replaced the pushrods there too. A good session last night, primarily focused on layout maintenance. We had a good crew down; myself, Dave, Neil, Ray and Tom. Neil and I worked together as much as we could on solving some of the physical and electrical problems in Dock Yard. When I wasn't finding tools or fetching supplies for the other guys, he and I were working through the 'punch list' of problems we found after the last Op session. 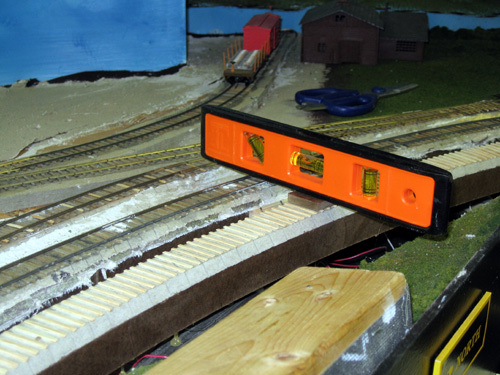 The dead track on the crossover from the yard body to the freight house lead turned out to be a frog-polarity microswitch that needed adjustment, as well as at another turnout Dave found. 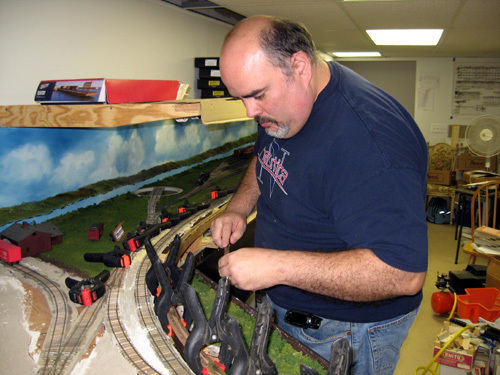 Neil put some work into trying to stabilize the turnout for the Iron Works track, which has been a problem to keep in gauge. He installed some PC ties under the points of the turnout to help hold the gauge there, and that helped. But in looking closer he also found bumpy track, missing feeders, and other problems beside the gauge. He did as much as he could and it is better now - but we will have to go back to that one again. 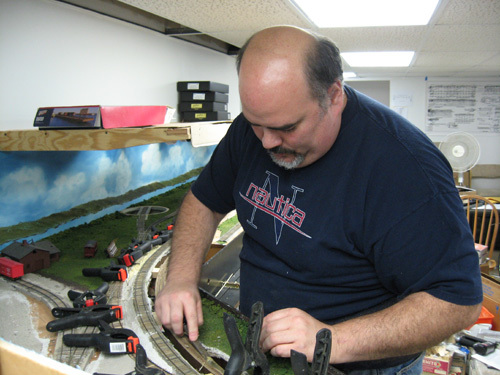 Tom and Dave worked on replacing the pushrods at a lot of the newer turnouts on the layout. Turns out the stiff-leg pushrods are putting so much pressure on the points of the turnouts that the points are popping off the throwbars. By adding a Z-bend of sorts to the pushrod, a lot of the extra force is taken up by the pushrod, easing the stress on the turnout points. They got a lot of the turnouts around the RR (Georgetown, Wilton, Wilton Creamery siding) done, which is a big help. Dave also replaced a balky old Mark I switch machine for me that had been under the float bridge at Wilson Point. I have to hook up a new linkage for that one, but at least now it will work - the old one not so much. And Ray wanted to know why the Spectrum 4-4-0's run so much better than the Spectrum 4-6-0's, so he spent the better part of the night tearing one of each apart to see what the differences were. He found that the electric pickups on the 4-4-0 were mechanically superior to those of the 4-6-0, because they have less than half the number of soft mechanical connections (which are places for the connection to fail). 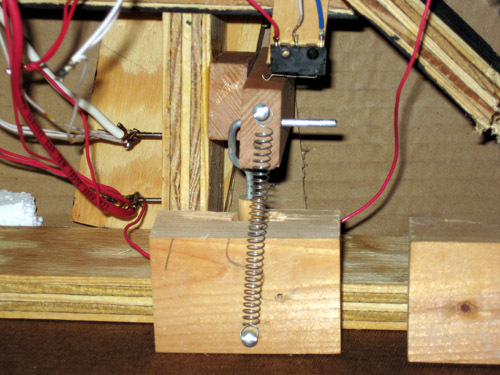 Ray would like to retro-fit the older 4-6-0's to have better pickups like the 4-4-0's, including a feeder soldered to the axle wiper that connects to the decoder. I think we can make that work, he says he has some very thin and flexible wire that could be used without causing much sideways stress on the trucks. I'm looking forward to trying that, it should help! A pleasant surprise today, I got a call from Henry Freeman, who offered last week during the op session to help out with shopping the cars on the layout to get them all properly weighted, check the couplers and trucks, etc. He called to see if I would be home, as he was going to drop by with some boxes to take the cars home with him. I said sure - and was surprised when he repeated that he was going to take ALL of the cars. I had not expected this, what an incredible offer of help from him and Jonathan Jones, who will be helping him. When Henry got here we spent about an hour walking around the layout, picking up cars and putting them into boxes. I think I sent close to 200 cars with him when he left, including a few freight and passenger cars that still hadn't been built yet. So now the layout is looking particularly bare, except four a couple of locomotives hanging out in Dock and Wilson Point with nothing to do. It's very strange, I haven't seen it like this since we were building Dock Yard two years ago. Well, as Henry said it will make it a lot easier to make the necessary repairs to the yards this way. No kidding! 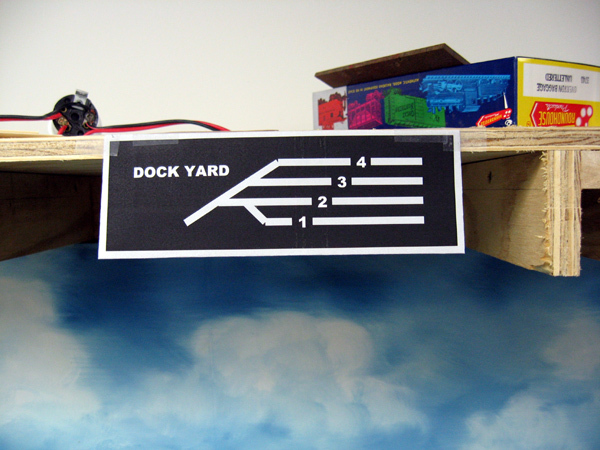 I also did some signage work for the Dock Yard area. Neil said he could have used a map to help figure out where to put things, and also to explain where to have others pick things up or drop them. So I came up with the two signs shown below. These are temporary, if Neil likes them I will print them in color and mount them on the fascia when the time comes. We had an Operating session today - check out the Operations Journal for a full report! Well, it finally happened – I always knew I was justified in building the benchwork of the Housatonic so heavily even when people gave me crap about it. “It’s so expensive!” “It takes too long!” “It’s so heavy!” Crybabies. I always said I built the way I do in case anyone ever fell around the layout and tried to grab onto it to save themselves from a fall. That said, I never imagined the layout would ever truly be put to the test – or that it would have been me doing it. But this past Thursday I unwittingly got the chance to put my money where my mouth is. So as I was trying to set a spike into the pliers correctly with both hands, my worst nightmare happened – the plastic stepstool lost its grip on the floor and shot out from under me. I went down hard and forward, my entire 190+ pounds coming to rest on the edge of the layout. This knocked the wind out of me, but I was afraid to put my hands down to catch myself lest I smash a structure or railcar model. So my belly took the brunt of the impact, after which I started to slide off the layout, scratching up my belly on the fascia as I went down. In a moment my feet touched the floor and I managed to get them under me stopping the slide. I took my weight off the layout and grabbed at my sore scratched and bruised skin. The layout had taken the full force of my bellyflop onto it and not budged an inch, or even a fraction of one. I shudder to think what might have happened had the layout been constructed from lightweight components, 1x2’s and extruded foam. I probably would have gone right through it, possibly being impaled on one of the legs holding it up or cut by a broken L-girder or drywall screw, or injured from dropping four feet to the hard cement floor. Ow. At the very least without considering injury to myself, it would have taken months to repair the damage to the layout after taking down probably 6-10 feet of it. As it was, I just dusted myself off and went upstairs to put some salve on the scrapes and go to bed. But I was able to get right back to work on preparing for the op session the next day because that layout took everything I could throw at it – literally – and held up like a champ, like it had never happened at all. So yeah, maybe my methods are time-consuming, heavy, costly and overbuilt – but you know what? It worked. It did what it was supposed to do when the worst-case scenario happened. So I ask you lightweight-benchwork guys out there - How would your layout hold up if you were perched over it and fell directly on it? Would you have anything to go back to the next day? How many months would it take you to rebuild, how much money would it cost to buy new foam, wood, track and cars / structures to replace what got destroyed? What injuries would you have after crashing through it and falling to the floor? BTW the Op Session scheduled for tonight has been postponed until Sunday because of inclement weather - a freak snowstorm has blown up and dropped almost 10 inches on us, when it was only supposed to drop 2. At least it gives ma a little more time to get ready, which I really needed. Not much to talk about tonight - my nights have been filled with trying to finish up projects and get the layout cleaned up for the op session scheduled for this Friday. The new guy, Pat, came over and gave me a hand doing a little cleaning, putting stuff away and rubbing the old track cleaner down through dock yard, while I was grabbing stuff everywhere and trying to find a place to put it. In the process of doing that, we came across some track problems in the yard that have to be addresed before the session - proken points, tight gauges - I can see that I'll be very busy Thursday night. It will be a miracle if I can get this all up and running for the session. Moderately attended session tonight, but I got good work out of everyone who came. I got started early with getting the last new turnout installed down at Dock Yard, and while I was working on that Ted Pamperin showed up. I set Ted on a car -maintenance odessy that started with matching car cards up to new cars, then putting in new waybills and getting them staged. From there, he moveld on to getting my B&A cars tuned up, and finally he took the tank cars that had broken couplers and repaired them too. That will really help a lot to get the tanks back on the layout, we have so few of them as it is. I learned, as expected, that I need to make up more waybills for boxcars because we ran out! I have to make some time to do that in the next few days. Neil came down, and I asked him to do some track maintenance, specifically cleaning track and looking out for any problems that might have cropped up since the last op session. He spent a lot of time cleaning tape residue off the railheads around Winnipauk, and then worked his way up the like towards staging. On the way he found a couple of switchpoints that had come undone, and they got fixed as he went along. Dave arrived shortly after and thanks to his experience with computer network cabling I asked him to run a couple of new lines for the fast clock boards that will be in staging and also for the dispatcher. He was able to run the lines and install the Ethernet plugs on the ends, so this weekend I can go ahead and get the panels / clocks built for those two locations. 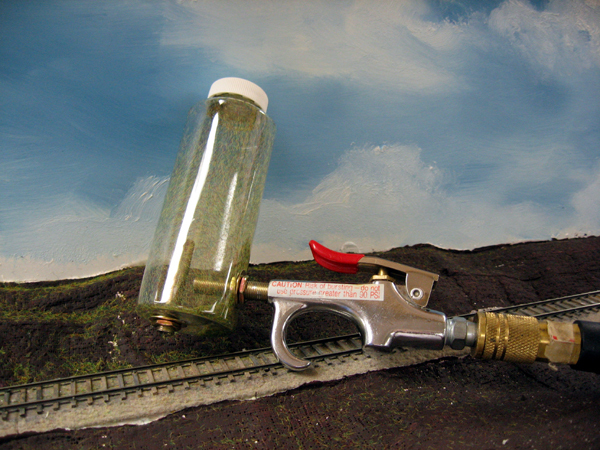 After Ted had to leave, Dave and Neil went to fire up the railroad and test the track Neil had been cleaning. There was immediately a problem, half the layout was shorted out. It was quickly run down to the new turnout in Dock Yard (not the one I just installed) which turned out to have the wires crossed and causing a direct short. I clipped those leads and the rest of the layout came right up. They tested the track all the way from staging to Catherine St., and determined that everything is running fine. There is a problem somewhere with a crossed feeder that is bridging two power districts but we can run with that until there is time to find it and correct it. Myself, I got the last turnout installed and wired (correctly) under the south end of the new siding, and also get the linkage mostly installed too. So the main line s now back in service – a big ‘phew’ for me. I also got a start on getting the layout cleaned up, which I’ll have to spent a lot of time working on over the weekend and into next week. Still grinning from ear to ear over the Giants victory on Sunday. I live about 10 minutes from Giants Stadium in NJ and it has been pandemonium around here for the last day and a half. I wish I could go to the celebration at the Stadium later today but I'm stuck here at work as I write this. Bummer. On the railroading front, Aaaack! I was looking through one of my reference books last night for a project I'm working on, and came across the two photos I used to generate the decals for my recent B&A and NYNH&H cars. I about plotzed when I realized I had gotten the decals right but applied some of them to the new cars in the wrong places! I never made any notes after preparing the artwork, and when I decaled the cars I did it from memory. Faulty memory, unfortunately. The NH cars are supposed to have the number below the initials on the left side of the car, not off to the right. And the car number on the ends of the B&A cars are supposed to be centered on the end at the very top of the car. Bloody hell. Well, at this point I'm not going to scrape the decals off and re-do them, it isn't such a grevious error in my book. But I think I will be more careful in the future about preparing a lettering diagram for my custom cars, and to *look* at it before I start cutting and wetting decals. How annoying. It will bug me every time I look at them in the future. Eventually I know it will get me so upset that I will have to re-do it. But not today. 18-1. Saturday was a turning point for me, it was the day I finally understood why people get really mad at the weathermen. All this past week it has been cold here, mid to low 30's. since last Tuesday, the weathermen have been saying that Saturday Feb. 2nd was going to be in the high 40s with light winds. Not exactly balmy, but just warm enough to do a little airbrushing so I could move a couple of projects forward. I made plans all week to keep my Saturday afternoon free so I could be out in front of the garage and do some painting. 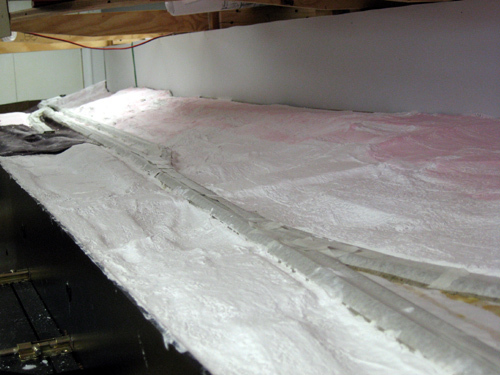 During the week I washed styrene wall panels in soap and water, and then dried them, and kept them covered. I separated window and door castings from their sprues, cleaned them up with a hobby knife, washed them and taped them to a large cardboard backer. I even went out in the freezing cold on Tuesday night to spray auto primer on all those parts, just so that everything would be ready on Saturday to get a bunch of stuff painted. All week I waited, watching the weather reports day after day - and still the weathermen were calling for clear skies and high 40's through most of the day. And when Saturday finally came, was all as they had told me it would be? Of course not. It was in the mid 30's and cloudy with chances of rain from minute to minute, and 10-15 mph winds. Perfect weather for airbrushing? Not! Not even marginal weather conditions for it. Still I've gone to all this trouble and everything was ready, so I set up all my painting stuff in the driveway and got to work. It was so cold that the paint absolutely would not dry on the models. It just ran into pools on the surface and sat there. As precious time slipped by, I waited and waited for the chill wind to help evaporate off the water in the acrylic craft paint. It was not happening. My buddy Neil who has never airbrushed before had come over to watch me work and pick up some pointers, but after about 20 minutes he proclaimed I was crazy and left me in the cold wet wind to my fate. 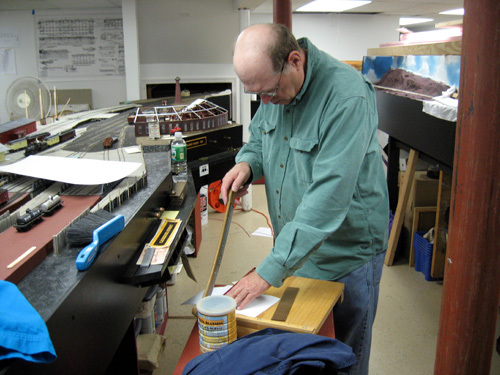 Now bear in mind HE is the reason I'm out there in the cold, because he has been harping on me to finish up painting the South Norwalk Freight house model so he can finish building it. Now - I'm trying to get the model painted for this guy in the freezing cold, for him to work on, and he up and runs away because it's cold? Nice going Neil! You Wimp :) Model Railroading is a MAN's game!!!! Finally I realized I had to bring my cardboard trays of parts in from the driveway to the house and arrange them on the kitchen table, under the ceiling fan, to coax them into drying. This worked, but It took about 20 minutes per coat to dry the paint. I was running back and forth, in and out the garage door with these trays and I could see that at some point I was going to trip on something and 50 freshly painted brown windows were going to land paint-side down on my hardwood floor. Of course this means I had to take extra time for safety and care in transport, and every minute it got colder and darker outside. I was getting worried the paint in the airbrush outside would freeze between coats. At least I was sure it wasn't going to dry. Now it had taken so long to do this job that my fingers were aching and trembling from the cold, I was losing the light and my wife wanted to make dinner but there were model parts all over the kitchen. I was not a happy guy right then! And that's when I got really angry at the weathermen. In the end I did not freeze to death or lose any extremities, and the freight house parts all got painted along with a half dozen of the new B.T.S. 'generic' radial roof boxcars Bill Wade made up for me. But Damn, it was cold out there. Interesting side note - the cold must have affected the way the paint clung to the sides of the B.T.S. cars, after two coats of my oxide red/brown paint (all I could stand before the cold forced me inside) it had dried a bit unevenly on the primed wood car sides. It actually looks a lot like a faded paint job on the wood walls of the car. I think it looks great, I'm going to leave it just as it is - I couldn't weather them that well myself if I was trying. Sometimes things just work out. A decently attended session tonight with several helpers. Neil came down and went back to work on the Branchville area, picking up from where he had been the last session. I had gotten several pieces of steel angle iron to reinforce the front edge of the benchwork last week, so Neil got to work attaching them to the benchwork - but not until he was done with a bit of benchwork surgery up there. Last time Neil had argued that the scene over Standard Oil was much deeper than it needed to be, and I hesitantly agreed that it might be for a few good reasons. Tonight he asked if it was OK for him to cut it back, and I said OK - but I wasn't watching him. He cut the benchwork back almost to the track by the stairway, which was deeper than I wanted him to cut. I still need to put something there to hide the track going into the wall, and I was planning on a barn with some trees or something like that - but there's no room in the foreground for that now. I suppose I sisn't explain that part well enough. What the heck, I can always add some of it back on it if I want to. After hacking apart the benchwork and rebuilding the front edge, Neil took the steel angle iron bars that I picked up last week and screwed them to the front edges of the benchwork in Branchville. This whole area had been sagging under its own weight for a while now, and it was obvious it was going to get worse soon. So now it is steel reinforced and we should not experience any more sagging, ever! After Neil got done with that he shimmed the spline up to match the roadbed coming through the stairway wall, and started putting down homasote roadbed on the splines through Brachville. I think the idea of using adhesive caulk instead of yellow glue threw him a bit and it took him a while to get used to it. But in the end it looked like he did a fine job. He got about half the tracks done, the other half can wait until the next session. I also was happy to see Ray, who hasn't been down in a month or so. Ray has now had some experience building Fast Tracks turnouts, so I asked him to build a #6 LH for me to go into the South switch at the new siding in Dock Yard. I have not closely inspected it yet but it looks like he did a fine job on it. Tom was also in, and he and I worked together on getting the new track in Dock Yard wired up to the proper buses, and we also installed the switch machine under the new North switch at DY. This coming week I'll make a small shelf and set up the rest of the linkage to finish that turnout, and I'll get the other needed junk for the new south switch ready too. I'm hoping to have everything done on the physical plant electrically and physically be the next session so we can have a operating session in late February. No work session this week, and I've just started a new job so not a lot of time to work on the railroad until things calm down a bit. 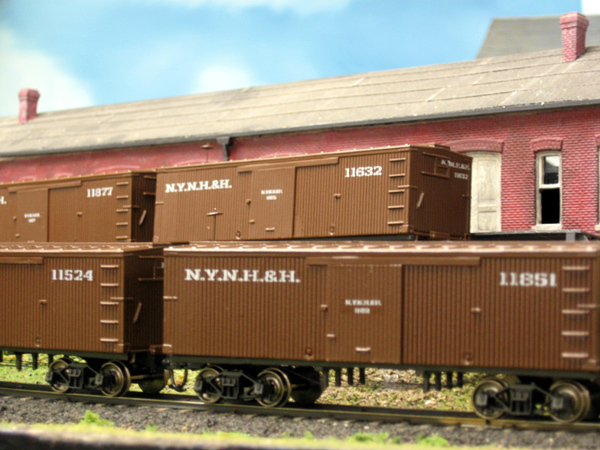 But I did have time to finish up the AHM boxcars at the end of last week - here's a few photos of them, I'm actually very happy with the way they came out. a significant improvement on the original trainset quality cars, they are now good enough to be permanent residents on the layout. After many new details including door tracks, truss rods, brake wheel, body-mounted semi-scale couplers and a new custom paint job, these cars look and feel the part even if they still have molded-on grabs. Very soon it will be time to weather them, I've been collecting materials to try Scott Mason's weathering techniques and I'm looking forward to making a lot of models on the layout look a lot more realistic in the near future. Anyway, here's some photos of the completed AHM cars, decorated for the New York, New Haven & Hartford complete with correct period decals. A quiet session tonight with just myself, Ted P and Wayne, but we managed to get a few things done amongst ourselves. Ted and I have been talking a lot about how to work out the new design for Bethel, and we got to apply reality to theory tonight, at least partially. After the last session I went back to the drawing - er, program - and redesigned and moved the town of Bethel about 10-15 feet to the south. Ted and I looked it over earlier this week, and tonight we got to work on implementing it. We used the section of plywood that was previously cut for Bethel and recut it to fit the new space over the Norwalk Iron Works. We were able to salvage about 70% of the large plywood field by cutting around the problem areas, and a big chunk of the remainder got trimmed and placed in the area over Dock Yard. Speaking of that area over Dock Yard - It was like cutting off my own arm, but the heavy-duty heavily, engineered support arms that were to hold up Bethel in its original position have now been cut back to half their original length. Never has a length of shelf-style layout benchwork been so heavily supported as this section of 13" wide is. It will NEVER bend or sag. As much as it hurt me to cut it back, the inproved view and access to the throat of Dock Yard was immediately obvious, and the pain was mitigated somewhat by the idea that I could now actually see what was going un under there. Future yard operators will be very pleased. Wayne got a bit of work done on the Roundhouse roof, trimming some long edges down to size and filling some of the joint seams with putty to close and level them. Next time I'm sure he will sand them flush. Unfortunately as he was sanding the edges of the roof he scuffed up the painted walls of the roundhouse a bit, they will need to be touched up in the future. 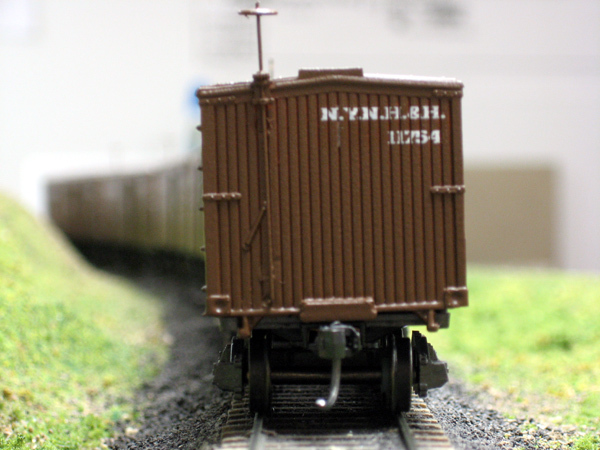 After everyone left, I dot back to work on the AHM boxcars again. Actually I've been working on them all week, filling holes where the grossly oversized door tracks used to sit, applying new styrene door tracks, brake wheels and the like. I've also spent a fair bit of time filling the holes in the frame, installing metal wheelsets, stringing new truss rods and applying Kadee couplers and boxes to the frame too. The cars will get painted tomorrow after a good washing, and then decaled for the New Haven Railroad. I'm very excited, I think they are going to come out pretty good for a bunch of cars that started off as mere trainset toys. I'm also really glad that another project that's been sitting on the workbench is nearing completion. I soon hope to finish the article on these cars I started last year here on the website. Well, no work session here this week, but I've tried to get a few things going. I spent some time last week and this week working on the design changes for Bethel, CT. I think I'm done - it will work, but I can't say I'm thrilled with it. The new design sits over the area where the Iron Works building is, and I'm annoyed that it will obscure the view of this scene. But I also understand that because of operations necessities it must be this way. The geometry of the new area and the constraints limit what I can do. I find the newly designed Bethel segment uninspiring and rather ordinary, but it will give me the sidings I need for operation while keeping the mainline and turnouts within reach of the edge, and free up the area over Dock Yard. It will have to come down to the scenery to make it interesting when we get to that. I also spent some time this week working on the new Mark IV switch machines. I've mentioned previously that a new design for the upper deck was necessary, and I've been kicking around ideas for a prototype for months now. Well, with the recent good weather I was able to get up to the garage and cut some new parts, and spent some time playing with them. 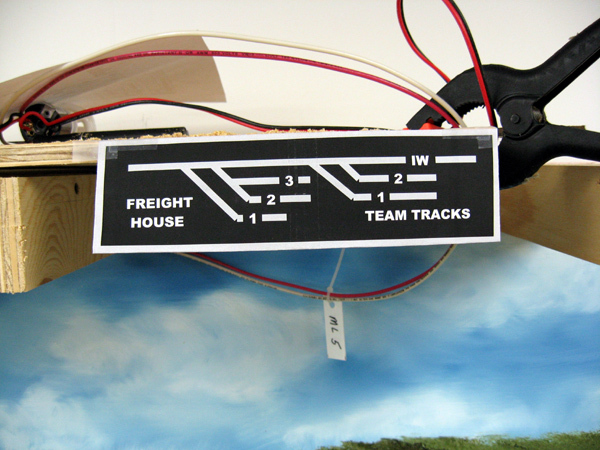 I now have a prototype that - if it works - wil be used to drive all the turnouts on the upper level. Ofe the machines I've designed, this new one is the simplest, easiest to build, and probably the most reliable design yet. I should be releasing some photos in the next few weeks, so stay tuned on that. 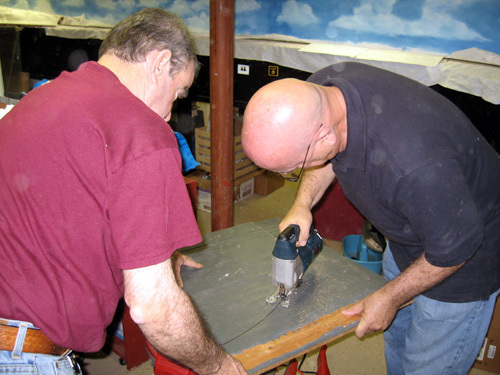 Also, Neil and I have been doing some work on building some of the 32' radial roof boxcar kits I bought from B.T.S. models some months ago. We now have about 2-1/2 cars built, and I'm very pleased with them so far. They look really good and build up into a fine looking car. I hope to get some painted next week if the weather will allow and maybe even get a few of them on the layout in Housatonic colors and graphics. Only another 17 to build! And I've been working on the AHM boxcars too, trying to get the small fleet of them that I have shipshape and ready to get painted. It's a fair bit of work but they should look really nice when they are all done. Other plans for the weekend are reinforcing the edge of the Branchville benchwork with steel angle iron to give it more strength and resistance to sagging, and to start laying down the homasote roadbed on the new spline in Branchville as well. Happy New Year! Well thanks to David being away on vacation (and now recovering), we had an unprecedented third work session in as many weeks this Wednesday. And not only did we get a lot of work done, we had some really good conversations about the design of parts of the upper deck which will result in some re-design soon. Neil arrived first, I have not seen him in a while so that was a nice surprise. I showed him around the many things we’ve worked on since he was last over, and then put him to work smoothing the spline around Branchville. It’s tough work with the surform tool but it is the best way to get the subroadbed level without using the belt sander, which would make way too much dust at this point. 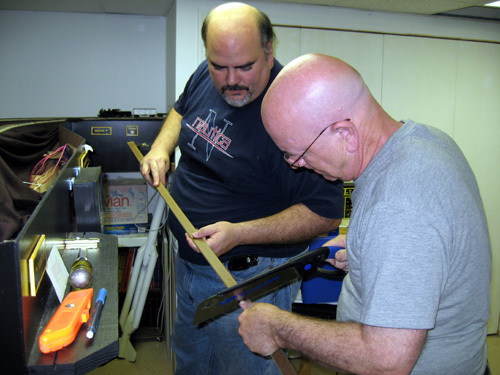 When David arrived later, he stepped in and worked with Neil quite a bit with the spline. Tom and Ted P arrived shortly after, and they got to work on finishing up the last of the spline installation in Branchville (away from the area where Neil was working). While they installed a couple of risers and put in the last of the spline, I worked in Dock Yard getting the first of two turnouts installed and spiked into place. In fairly short order Tom and Ted were done, and needed another job. So I put them on the new homasote roadbed installation for the upper deck into Bethel. 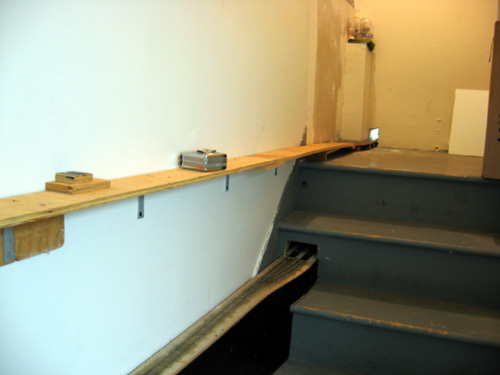 They took to it right away and got the roadbed in place along the stairway wall and to the curve at the base of the stairs, and then started asking questions about what to do next. I had explained earlier that I had re-designed Bethel the previous week after I realized the original trackplan was not going to work because of reach and inter-aisle interference issues. I had explained that I had moved the center of operations at Bethel south so it would interfere less with the Dock Yard yardmaster’s position. Which then brought the question from Ted, why not the whole town even farther south and away from the working areas of Dock Yard? Ted and Tom noted that the area over the Iron Works had few switches that needed to be reached by the yard crew, and a wide deck could easily be built out over the area that wouldn’t interfere with the yard at all. In fact, it was space otherwise going to waste (except to view the scene in South Norwalk) that could be utilized for the town of Bethel. And moving Bethel back to the wider area meant we could cut back the overhang around the throat of Dock Yard which would make it a lot easier to work in. Well, I hate to be shown when I’ve made a big error, but at the same time I could clearly see the logic in making a change like this. 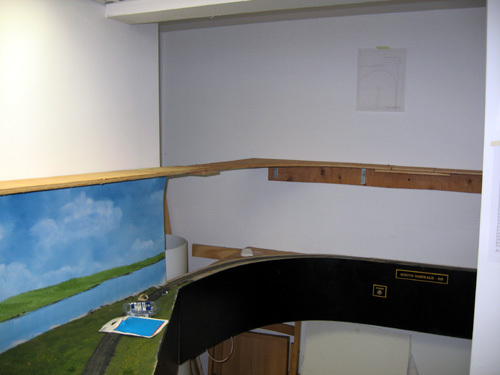 The only real issue is that we originally installed small metal shelf brackets to support a narrow shelf here, and putting up a wider deck will require edge support in the form of threaded rods hanging from the ceiling. Well, I can live with that considering the benefits that will accompany the change. So far the only downside is a day after the session, I’m having some trouble trying to fit a curved design for Bethel into the available space. I need to keep any turnouts within reach of the edge, which also seems to mean keeping the mainline and siding close to the edge. This means the plan will get less prototypical and so far, a bit contrived. I’m hoping to have a eureka moment with this soon and find a better plan, but I’m not really hopeful. I will probably need to consult with the braintrust on this and see what they can come up with. Had time today to go downstairs and do some work on the RDA kitbashed mill. I spent a few hours last night watching Scott Mason's Building Craftsman Structure Kits DVD's, and deciding on how I wanted to attack the brick on the structure. I decided to attempt some of the techniques from the second volume where he dry-brushes some black and terracotta accents onto the standard red brick color, and then floods it with heavily diluted cream or buff colored paint. I used some of the acrylic craft paints I have to do it, and had better results with it as I practiced some. It took a few hours but I got the building looking pretty nice and weathered looking. I then painted the doors on the building green, which looked really nice. Then I took the windows for the building and used another of Scott's techniques to work on them, glazing the panes with canopy glue. I've seen Scott's work in person and knew it would work but I always feel a bit nervous doing something new. I smeared the glue over the backs of the window castings and waited for them to dry, and sure enough, the glue stayed skinned over the panes and dried clear. They look great! I also used the canopy glue to install them, because the windows and walls were both painted and styrene cement would not have worked. We I had the opportunity to spend a few hours in the basement this weekend (more than a few really) and on the computer made some headway on a few layout projects. First, I took some of the new ideas from Wednesday’s brainstorming session and came up with a plan for the north end of Winnipauk, which had been a completely bare spot on the plan for years. This area will now have its own mill pond, sluice gates, and a canal raceway that will run alongside the Norwalk Mills building and then off the edge of the layout. I based some of the details on mill photos I’d taken at the Ames Iron Works in Canton, CT last year. I think it will be a really neat scene when it is all said and done, and may rival the scene at the south end of town. I’m getting very excited about the scenery in this area. A part of the new plan for North Winnipauk will also be an expansion of the Norwalk Mills complex. 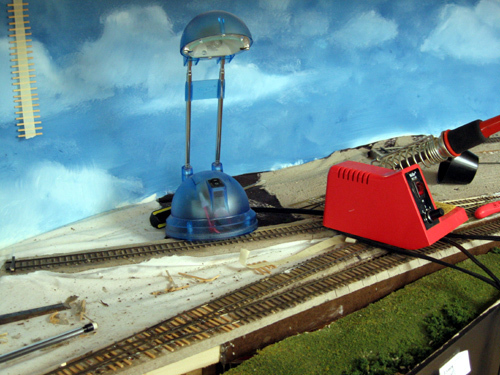 Currently there is a large mill kitbashed from two RDA Easton Mill kits next to the tracks there. I had already decided to put a second ‘stock’ Easton Mill model perpendicular to the big mill, but now I’ve also decided to build a third mill building of similar proportions to the big mill that will sit across the tracks from it. 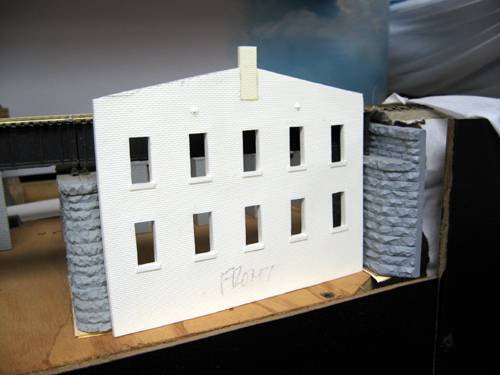 That building will be scratchbuilt and have clapboard siding as opposed to the brick of the RDA building. A boiler house may also be placed in near the siding, I haven’t decided that yet. A station will also be located between the two mills in Winnipauk as well. I’ll likely use the Walthers Golden Valley station, if I can get my hands on one. It is a fair representation of a D&N type station, though the roof is not as steeply peaked as it ought to be. 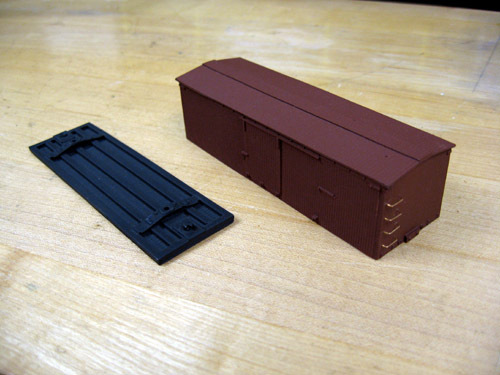 But I also spent several hours working on finishing the Dock Yard siding. I got nearly the whole length of the siding spiked down, and then managed to install a Fast Tracks turnout at the north end before I had to head off to bed. I hope to finish it all up on Monday, including getting the new feeder wires hooked up and the switch machines installed. Maybe we will actually be able to have an op session in January. To finish out 2007 I had a Friday work session, to help out some of our group who normally can’t make it on Wednesday nights. I had three guys show up, and we got some good work done. It was great to see Ray again so soon, and he readily agreed to go back and continue working on the scenery supports around Winnipauk. I gave him some general guidelines of what the scene should look like (very general), and let him be to do his thing. Not long after, Tom and Bob arrived and since both of them have had experience doing spline work now, I asked them to put in several sidings at Branchville that had not been done yet. I had gone ahead and put in the turnout starters earlier in the day, as well as the spacers, so all they had to do was lay in the splines. They managed to get two out of the three done, and would have finished the third but had no risers to lay the spline on. Still it was great that they were able to get as much done as they did. I had hoped they would start the leveling process but that was too much to hope for. While all this was going on I decided to pick up where Bob had left off a few weeks ago and continue spiking down the rails to the new siding in Dock Yard. That project has laid fallow for too long, and I decided that if it was going to get finished I was going to have to do it myself. I didn’t get too far, but I got a good start on it, and actually got into it for a while. I think I’ll find it easier to go back to this project soon and maybe finish it up. After Tom and Bob left, I went over to work with Ray. 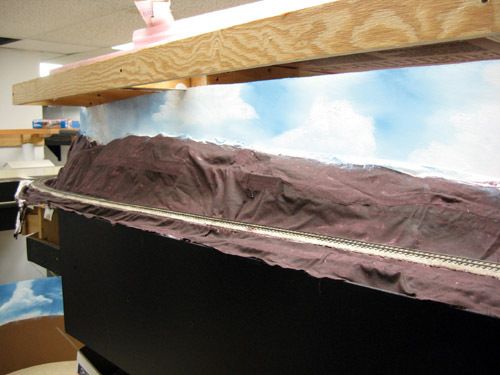 He had put in a lot more of the cardboard scenery supports and covered them with the fabric. We decided that since we had the plaster gauze cloth on hand, we would give the hardshell layer a try. Ray taped over the tracks and I started cutting the plaster cloth up into strips, and soon we were laying down wet plaster cloth all over the town of Winnipauk. It went pretty fast and wasn’t as hard or scary as I thought it would be. When we had covered all the supports, the scene had taken shape and was easier to see. In looking at the new landforms, I had some new ideas about what to do in some of the open areas around Winnipauk. Specifically about canal raceways and mill ponds which would have been an important feature of a water-powered mill scene like this. Ray and I discussed the ideas at length, and I think I will draw some of them up in the next few days. A good night tonight – we got a lot gone, which made me really happy. Wayne arrived first, and I asked him to go around the layout and touch up any bright rails with the new Rust-paint pens by Floquil. They work great, and in no time he was painting rails everywhere. It’s a small but important job and I was glad he worked on it. Wayne also brought down a bunch of car kits he had assembled for me - always good to have more rolling stock show up on the layout. 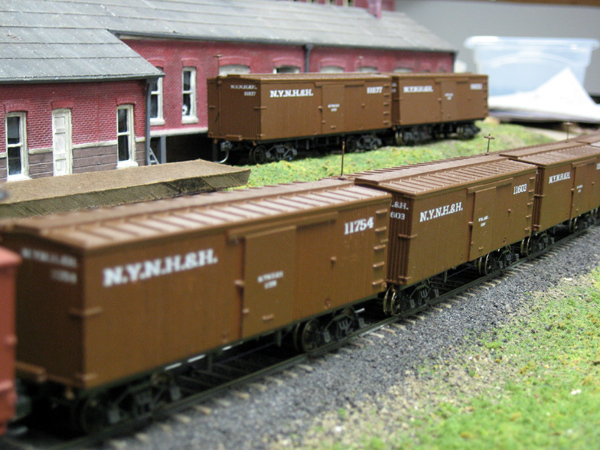 I now have a small fleet of flatcars that used to be wooden tank cars thanks to Wayne - it was great that he could take the time to rebuild them for me. Ray arrived next, who I haven’t seen in a while – that was a great surprise. I set him to work on the scenery supporting forms around Winnipauk, filling in the areas I had already started with cardboard forms. By the end of the evening he had filled in a pretty good chunk of the area, and covered it with fabric too. Unfortunately the cheap dollar-store glue guns I gave him to use didn’t hold up very well - one of them even shorted out and almost burst into flames – but even with that he kept going until he ran out of glue sticks. Thanks Ray for risking life and limb for scenery! Ted P was down too, and he and I got back to work on putting in more spline roadbed in the area of Branchville. A month or so ago we had laid in the sub-roadbed for the main line going through town, now it was time to start putting in some of the sidings and other tracks. We carefully transferred measurements from a scale drawing of the plan and glued on some of my turnout starters, then added spacer blocks to the existing spline and layered on new splines for the sidings. After Wayne was done painting rails, he came over and helped us for a while too. Ted and I spent a fair bit of time making sure that the sidings were installed properly, especially the branch track that runs behind the station and then off into staging, up to Ridgefield. We set a single spline into place and pinned it with screws to hold it, and used a piece of 1x3 to keep the section behind the station straight (we clamped the splines to it as the glue set up). In the end it worked out very well, and we got in all the important routes. I will try to finish the spline work up in the next week so we can start putting in homasote roadbed and ties at the next work session. We started getting more plywood up on the supports for the upper deck coming out of the staircase from Branchville. We will very likely be pulling it down again soon to try and build up the roadbed and lay track on it down where it can be easily reached, instead of high in the air over most of our heads. The plan is to do Bethel and its approaches this way, then continue on and start working on parts of Danbury in the same way. This will be similar to the way we built Dock Yard a few years ago, but this time there will be better access underneath and hopefully a better designed switch machine for the low-clearance application. the new deck will be very low profile to maximize the airspace over the lower deck. 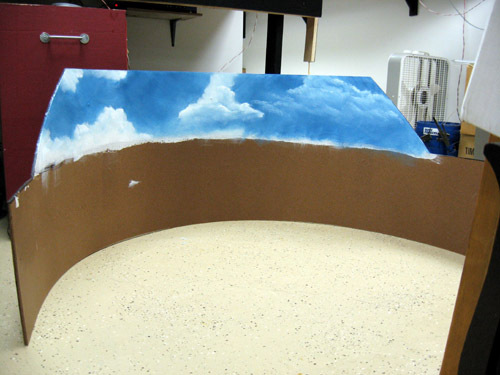 The subroadbed will be of 1/2" plywood, with 1/2" of homasote on that as roadbed. Ties and rail will go over that so in most places the thickness of the deck will be only a bit more than 1-1/8" from bottom of deck to top of rail. The land forms to either side of the roadbed will be made up from sheets of extruded polystyrene foam for weight and ease of sculpting. And speaking of the new switch machines, I had a long discussion with Arthur Ross, a fellow tinkerer, about ideas for my next project with them. We spoke for about an hour a few weeks ago and came up with a good preliminary design for a machine that will work similarly to the current Mark III machine being deployed on the lower deck, but with a considerably shallower profile. I need to work on the prototype later this week but so far it seems like the design will work well, at least on paper. 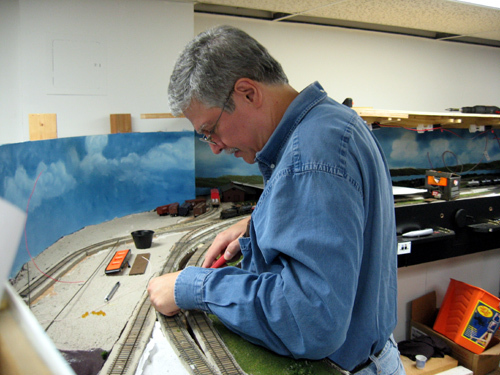 I have spent considerable time in the last month working on cars for the layout. 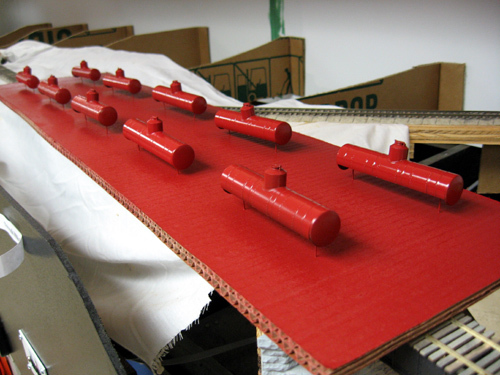 A couple of weeks ago I pulled almost every tank car off the layout, stripped the paint off and repainted them red, and decaled them for the Union Tank Line. 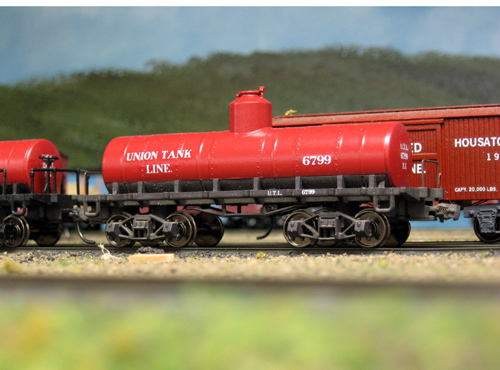 These now provide a more realistic and prototype look to the trains they move in, as nearly all the tank cars that ran on this railroad would likely have been UTL tank cars and not the crazy mixture of cars that we had before. It did point out to me again that I desperately need to buy or make many more tank cars for the layout, as the 12 I currently have are not nearly enough. 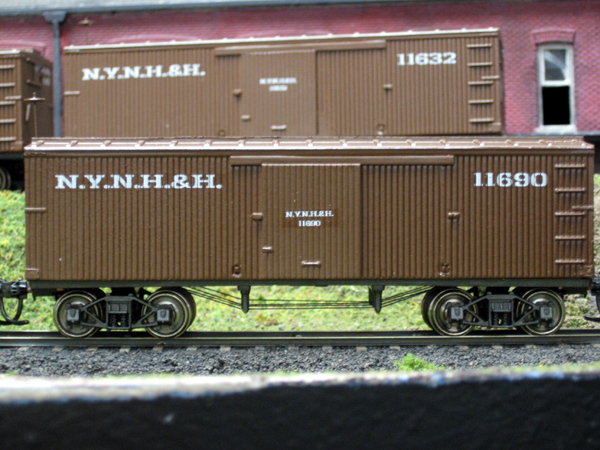 I also have been working on my New York Central 30’ boxcar models on and off; I finished assembling four of them last month and in recent weeks I have applied grab irons, weighted them and painted them. I decided to decal this bunch for the Boston and Albany railroad, which would likely have run them as well as the NYC&HRRR. I just finished with the decals and trucks and couplers yesterday, and I’m very pleased with the way they have come out. I still need to do a little more work on them to finish them up (brake wheels) but already they make a fine addition to the fleet. I have been making some modifications to the kitbashed RDA kit I had placed in Winnipauk a few months ago. Discussions with David Emery, another early period New England model railroader and also some studies on my own shower I had chosen the wrong roof design for the building. I want back and forth over whether it mattered to me for a few months, and then a couple of weeks ago I ripped the roof panels of the model, and they are currently waiting to be trimmed on my tablesaw to a more architecturally accurate profile, with much narrower eaves. I also used CadRail to plot out the proper shape for the cross-gable panels, and will get them cut out soon too. Once the corrected panels are re-applied the building can get painted and start having details like windows and shingles added. I will also get the third Easton Mill kit I have out and assemble it to finish the scene – it should be a really attractive-looking vignette when it is all done. Speaking of structures, I have also started working on the other mill in Winnipauk too. 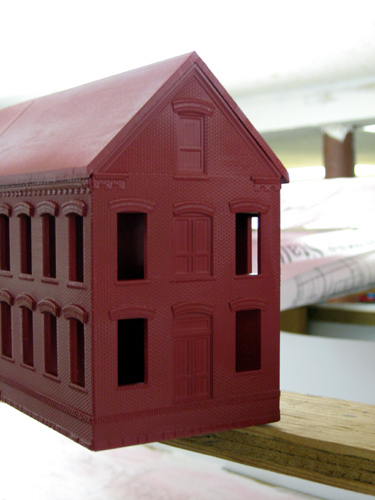 This model will be based on the castings we originally made for the Norwalk Iron Works building, but they are cut down and reworked to give a different look to the building, and will have additional added elements to disguise their origin. I started by cutting the lower floor off the castings, and then changing the pitch of the roof. I’m not entirely thrilled with my first efforts on the gable ends, I may need to re-do part of that – but the sides are coming along well. 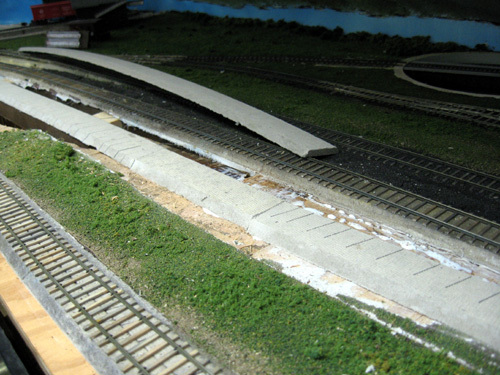 I have already made the cuts in the resin castings to fit the loading doors on the track side, and a set of N-scale stone viaduct kits are going together to build the foundation and spillway gates of the pond side. I hope to show some pictures of this in-process model being built soon. About a month ago I started putting in scenery supports through Winnipauk to get a start on the scenery there, but I haven’t gone any farther with it – I really need to get in there and do the backdrop first anyway – maybe this weekend I’ll break out the paints and get the sky and clouds on. I enjoy doing it but it seems hard to get motivated to actually get started. All operating sessions are currently on hold as we recently hacked into the track going through Dock Yard to cut in the new switches for the new siding going in there. Unfortunately it isn’t finished yet and no trains will run until it does get finished. I should have done it already but frankly I haven’t been interested in doing trackwork of late, so I’ve been hoping one of my friends with skills will tackle it and get it done. But it looks like I’m going to have to do it myself after all in the near future. And that’s pretty much what has been happening over the last six weeks or so. If I think of anything I forgot I’ll put up a revision. We have a work session coming up in about a week, I hope there will be some exciting new developments to report after that. This weeks work session was held on a Friday evening to avoid Halloween, which fell on our regular Wednesday work session. I had a good turnout and many good things were done. First, we had some new blood come down in Bob McQueen, whom I met a few weeks back at an NMRA regional meet. Bob lives in the area (well, an hour away) and expressed an interest in coming down to see what we were doing, so I extended an invitation. I asked him to help out with doing a little track laying, and though he hadn't done it in a while he agreed to give it a shot. Ted P and Ralph arrived soon after, and I got to work with them on the next section of the upper level. Unlike the lower level which is made up of grid benchwork, risers and splines to support the tracks, the upper level will have a narrower profile to provide as much clearance as possible between the two decks. This means 1x3 supports, often cantilevered out from the wall or cross-mounted from central support studs, 1/2" plywood substrate and 1/2" homasote topping that. This should allow a very narrow fascia edge along the front of the upper deck (supports are often narrowed at the edges). 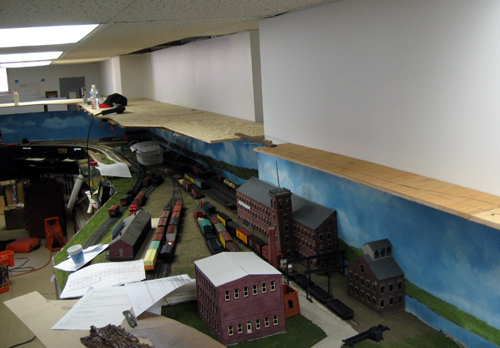 Anyway, over the last month or so we have been pushing the upper level benchwork out from the stairs, and this week we moved on from 6" shelves to the first wide area, Bethel, CT. Bethel will have a passing siding, a branch line which ducks behind the scenery in the back that bypasses Danbury (The New York, Housatonic & Northern) and a number of industry tracks. The scene gets up to 26" deep in some places, though most of the trackage will be up near the front. The last session, Ted P and I had done some measurements and drawings to figure out where and how to cut the plywood necessary for the Bethel shelf. Tonight Ted, I and Ralph took those measurements and translated them to a sheet of plywood I picked up earlier, cut it out in the driveway and brought it downstairs. The entire shelf was made up from 3 separate parts to cover the 11 feet of length needed, all cut from one sheet and joined with biscuits. We spent a bit of time jockeying it around into position and eventually screwed it to the supporting brackets that had been installed well over two years ago for it. We also had to take down and re-hang the lights off the lower level we had put up a few months ago, since now the wires were going to be in the way. Dave arrived while we were doing this, and I asked him to fix up a couple of Fast Tracks turnouts I'd finished up earlier in the week. Ray Louis had started them last session, and I jumped in and completed the filing and soldering he had done to complete what he had started. But Ray had not gapped the PC ties, so electrically they were one solid block of copper and nickel silver. Dave took a Dremel tool and quickly put in all the missing gaps to isolate the rails from one another and make the turnouts useable. Then he went over and gave Bob a hand with some of the track laying he was doing. Late in the session Tom came in, and I was so busy I couldn't think of what to ask him to do. I did ask him to do a little more prep work on the peninsula where Scott was working a few weeks ago so we could finish up the plaster gauze hardshell, and I think he got some more of the fabric there glued down and trimmed. After the plywood was down, Ted P and I worked on another project we have been planning for a while, rock molds. We had discussed using liquid Latex to build up some new molds but Ted wanted to go with the polyurethane mold compound we usually use for making railcar and structure molds. We prepared a new mold box using a foil tray and some hot glue to hold the masters down, and got to work pouring the new mold. It took a lot of material to fill the mold, but the next day I pulled off the new mold and it seems to have worked really well. Ted is very excited about this, and will be ordering more materials so we can continue to use this technique and make up some more molds. Now we need to decide what to cast the rocks from, which should be interesting. A quieter night than the last session. Just a few of us getting things done, Tom and Ted P, and Scott (down a second time in as many weeks, I may faint). Tom and Ted picked up where they left off on the new benchwork through the stairs, and got done with the bulk of it - looks to me like it is ready for homasote. I tried to give them a hand, but it seemed like I was just getting in the way so I left them alone to do their work. Here's what it looked like when they were done. 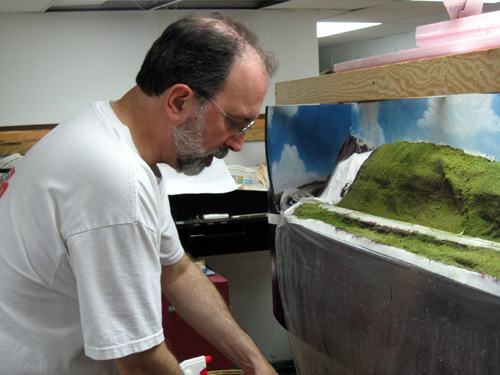 Scott also picked up where he left off working on the scenery on the narrow side of the peninsula. He worked on putting down new plaster cloth until he ran out, then he grabbed the dirt-colored paint bucket and ground foam and started laying in some basic scenery along all the work he'd done there to date. We will have to scrape off a bit here and there to apply some small rock castings, but it really helps make that part of the scene come alive. I'm going to try to spend some time in the next couple of weeks putting in some new scenery supports around the other side to continue the good work Scott has been doing. It would be great to get a lot more of the lower level with basic scenery and having a place to locate the structures I want to build soon! David was down also, and I asked him to sand down the new ties I had installed along the new sidings in Dock Yard and Georgetown. He only got to the ties in Dock Yard and seemed to be having a lot of trouble with it; I don't understand why as I had gone through the night before and sanded / leveled it myself before gluing down the ties. I may have to go back and see what happened, I may need to make adjustments and/or replace some ties if areas are sanded too thin. Wow! On a night when I expected to be standing around in the basement by myself, I ended up having a ton of help. A very well attended session by any measure. Arriving early was Ray, who we haven't seen in a little while, and he decided he like to work on some Fast Tracks turnouts for me. So I set him up on the workbench with all the materials he would need and let him go to work. Not long after a flood of talent came flooding in - Wayne, who got right to work on the Wilson Point roundhouse again, Scott Dunlap (also been a while since we've seen him) grabbed the plaster cloth and started firming up the scenery around the Bellinadrop. Tom arrived about the same time as everyone else, and while I was trying to get the others set up Ted P arrived also. The two of them got to work on solving the problem of getting the tracks through the stairwell wall a second time, and decided to attack the problem from the Bethel side. We spent a little time fishing out 1/2" plywood from the garage upstairs and doing some cutting on the tablesaw, then they started creating the benchwork surrounding the stairs. We used a laser level to determine the approximate height the hole in the wall needed to be, and they went for it - and everything worked out great. The track comes into the stairwell about an inch higher than the stair platform, and matches up with the spline on the far side (Branchville) perfectly. Ted and Tom were joking that I was going to take credit for their hard work - I won't. They did a great job executing the plan I came up with years ago! I was also glad to get Neil down tonight. He volunteered to work on re-installing a turnout linkage under Dock Yard that wasn't working properly, and with a bit of help from Ray they got it fixed. Later, Neil got to work on smoothing and leveling a lot of the spline that was installed last session, and by the end of the evening had done both of the sidings at Dock Yard and Georgetown and gotten homasote down on them. There are a few spots that will need to be shimmed but that's OK, he did a good job. Little by little more and more of the upper level benchwork is going in -- it looks like soon we may be able to start filling in the spaces in between with benchwork and get some more track down. If that happens, wh might be able to open up the second deck sometime next year (but probably without the Danbury area). Either way, several of the guys said it felt good to see real progress happening on the layout again. Funny how a few pieces of plywood can stir up so much enthusiasm! Well, a lot got done tonight as I had hoped. Amazing how a little planning can help rocket your progress forward. It was good only three guys showed up, though, as I hadn't planned well enough to keep more than three guys and myself busy. Wayne arrived first as usual, and I suggested it might be a good time to get some work done on the Wilson Point roundhouse roof. He agreed, and I set him up with my paper cutter and he sliced himself off a big chunk of .030 styrene. He then got to work making new sub-roof panels, and did a pretty good job by fitting one panel to the next, tracing the edges, cutting on the lines, gluing it on and moving to the next panel. By the end of the night he had done a little over a third of the roof. I'm glad that project is moving forward again, though some of the guys had suggested leaving the roof off might not be a bad idea so they could see where the locomotives are in the building. 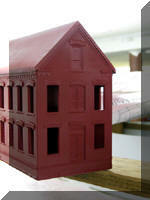 I'm stil considering that (maybe using a clear styrene subroof with a removable layer of shingles...?). Ted P arrived next, and I asked him to give me a hand with the spline work for the new passing siding at Dock Yard. He agreed, and while I was getting set up Dave arrived, so I put the two of them on the project and went on to do some more prep work for them. Dave is an old hand now at putting in spline, so within a few minutes they were busy laminating one strip after the next onto the spacer blocks. In no time the siding was in, though it will need a little finish work because it was tough getting the strips into the scenery opening and aligning them before the glue set up. As they were doing that I was installing turnout starters over in Georgetown. By the time I was done with that Ted and Dave were ready to move on, so they came over and started working on spline in Georgetown, putting in a new passing siding there too. This will be a much shorter siding, really only for passenger trains - this was very common on the Housatonic, a lot of stations had sidings only a few hundred feet long. Ted was worried it might not be useful, but I explained there would be a much longer siding up at Branchville, the next town north, so the short siding would make things interesting without being a bottleneck - I hope. About then Dave and Wayne had to leave, but Ted stayed and we worked on getting the main line extended up through Branchville. Now that Ted had some spline under his belt, he was raring to go. We surveyed the line across the virgin benchwork and set to work putting in new masonite strips. In about a half hour, we had extended the line all the way to the staircase, and now I can start plotting out where the passing sidings and industry spurs will go. And that completed my list of what I'd hoped to get done for the night, so I was really pleased with the progress. 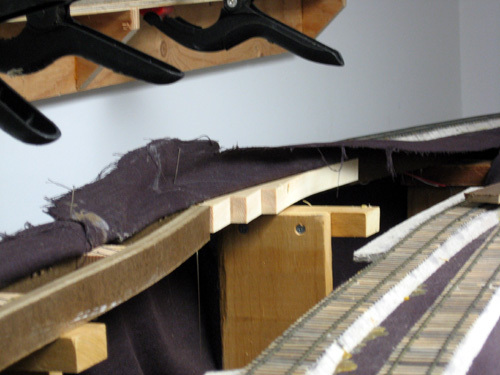 Before the next session I'll level off the new spline roadbed, apply fabric and homasote roadbed, and hopefully new ties as well. I'll also see if I can put together a few Fast Tracks turnouts to drop in and hook up, which will let us get the sidings operational before the next operating session sometime in October. Another weekend day to work on the layout! Didn't have any help, but I did manage to get a bunch of things started and some other things done. First, I spent a little time building a few more car card boxes for the layout. While the glue was drying on that project, I got to work doing some surgery on the Dock Yard area. I decided it was time to get started working on the new passing siding around the yard, so I started cutting out the scenery next to the main line out from Wall Street to almost the gas works siding. Since I was by myself, I wasn't able to do any spline work, but I did get the turnout starter in place by Wall St. and placed a bunch of spacers in next to the existing spline. During the next work session I hope to have a few of the guys give me a hand with it, should go quickly. When the car card boxes were dry, I got out the gloss black paint and gave them a coat, plus the new shelf that got installed a few weeks ago. Shortly after that I mounted them to the fascia, and I'm glad that job is finally done. Finally, I had some time to work on some models, so I got out a couple of my B&A cars and drilled out and mounted some grab irons on them. A few more details and I'll be able to paint and decal these models, and get them on the layout. I also did some work on a old gondola model I'd added too much weight to and removed the bits restricting the trucks from turning. Ahh, a free weekend day to work on the layout. Seeing as it was going to be a few weeks until folks are over to work on the layout again I decided it would be a really good time to work on the backdrop around Catherine St and up into the Bellinadrop. While my wife had a friend over, I asked them to give me a hand and the held the Bellinadrop up while I removed the screws that held it in place, then I had them place it on the floor. After that I got out my oils and started painting. I'm still really happy with the Bob Ross wet-on-wet technique, I think it gives great looking results. One of these days I'll put up a web article on how I do it - it isn't hard to do and looks great. I spent about 2 hours extending the sky and clouds up around the end of the turnback loop, and onto the inside of the Bellinadrop. After that was done and cleaned up, I decided to work on replacing the last few of the old switch machines out on the mainline. Tom and Wayne had put up the control shelves for the barrel bolt switch throws in the last work session, so I figured it was a good time to get it done. I quickly dismounted them and started replacing them with the Mark II machines. This went very easily even though I was working by myself - not having to crawl under the layout much helped a lot. Even mounting up the pushrods went pretty easily. Speaking of pushrods, I have to say that I have finally gotten it through my thick skull that a direct and straight run is just too much for the solder joints on the switch throwbars to take. 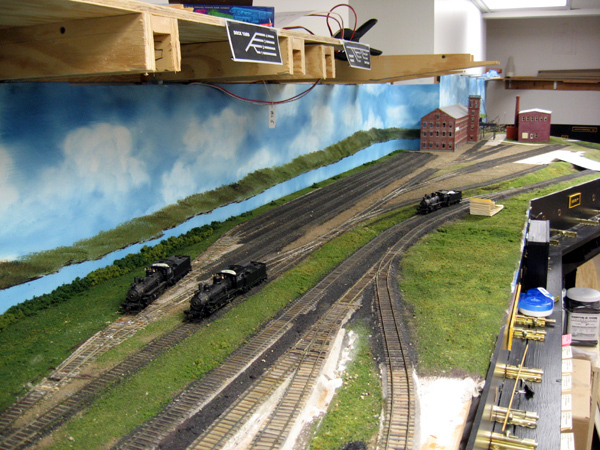 We've been popping them right and left all over the layout lately, and consequently doing a lot of repairs. When Arthur was last over we talked a lot about the machines, and he pointed out that having a Z-shaped spring bent into the pushrod wire would allow the pushrod to take up some of the compression force and take it easier on the points. Well, I decided to try it out this time, and I am pretty happy with the results. I'll give these some time to prove out whether they really do the job, but I can already see they work. It also simplifies adjusting the linkage, because you can simply extend or retract the end of the pushrod by adjusting the bends a little. I think I will be having another retrofit soon with the pushrods under Dock Yard, putting in more of these Z-bends to ease the maintenance there. 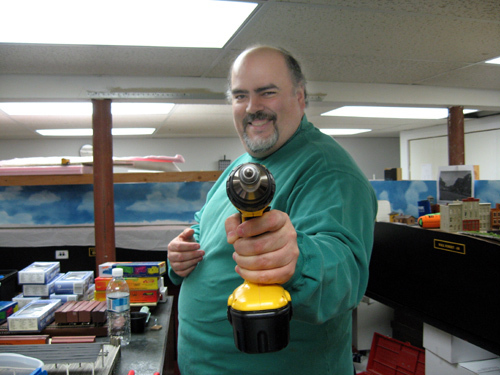 Before everyone arrived tonight I tried to get a couple of new control shelves and car card boxes for Winnipauk cut upstairs in the garage, but halfway through the job folks started showing up. I managed to get the one shelf I needed cut, though, so Neil marked where it needed to be cut and mitered to go around a slight bend, and I finished cutting it to fit as I got the guys started on some of the jobs. The session got off to a slow start, as the To Do list I’d prepared on Tuesday got cleaned up by the wife and was nowhere to be found. I did remember some of the jobs on it, though. I had Tom and Wayne get going on mounting the shelves around Winnipauk that will support the new switch controls there, and Neil got to work on a track problem (high guardrail) at Georgetown that needed repair. As usual, I spent most of the time fetching tools and supplies for the guys. When Neil was finished with the problem at Georgetown, he and I started working on the track problems in Dock Yard. I’d already fixed some major problems around the throat of the yard, and now we moved into the yard ladders. Phil had reported dead frogs back here that made it difficult to switch the back tracks, and I quickly learned the reason – the microswitches had never been wired into the power bus. D’oh! I quickly stripped the wire ends and soldered them to a nearby power tap, and the machines were wired up. And that pretty much did it for the night. I was glad the shelves got hung, and getting more work done on fine-tuning the yard was a huge step in the right direction. I plan to do some more work this Sunday on the yard, trying to finish up any issues around the freight house and team tracks. I’m now sure that the yard will be running in top shape for the next op session. Next week I’ll begin working on putting in the new passing siding around the yard, which should be a lot of fun. Happy Labor Day weekend to all! Well, that’s a bit late now that it’s over with, but I hope you had a good one. Mine was filled with family activities but I found some time to work on the RR on Monday. It was the first time I’d been able to get down there since the Op session two weeks ago (video games are an insidious thing) and I had a list of things that had to be fixed before the next one. I spent most of my time under the throat of Dock Yard. This was where the worst of the problems had occurred during the session, and I had a pretty good idea about where to start. Folks, this is a good time for a ‘learn from my experience’ PSA – don’t decide to solder up a few wires just before an op session with 12 people standing around. I promise you it will lead to no good. In my haste to wire up the last few connections I managed to (A) wire the frog for a critical turnout backwards causing a short every time a train ran over it, and (B) wired that same frog to the wrong switch machine. That pretty well bollixed up the yard for the whole session. The lesson is to wait and do your wiring when you have time to be thorough and careful. Anyway, I quickly figured out the problem and rewired the bad frog, and added a microswitch to the second turnout (which also turned out to be wired backwards). During this process I also found a broken feeder wire on one of the closure rails which wasn’t helping either, and when I got done fixing it all that stretch of track ran like a watch. Not a Swiss watch, but for now I’ll take it. The next problem was a serious dip in the track coming off the main and into the yard. Phil was having all kinds of trouble here with locos losing electrical contact and cars derailing. The vertical curve was so severe that the flanges on the wheels would ride up over the rail and lose contact. Plus, it turned out there was a section where the track was gauged wide because of missing spikes, and that didn’t help much either. You could actually see the dip in the track if you were looking for it – I was embarrassed that I never had. 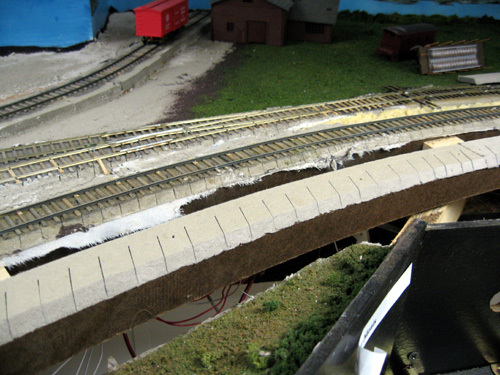 This was another problem that had to be fixed before the next session because this track is not only used by any train into and out of the siding, but also as part of the Dock Yard lead. Can we see why Phil was pissed yet? I spent some time here adding new ties to raise and re-grade the 30” section, leveling it out both along and perpendicular to the rails. 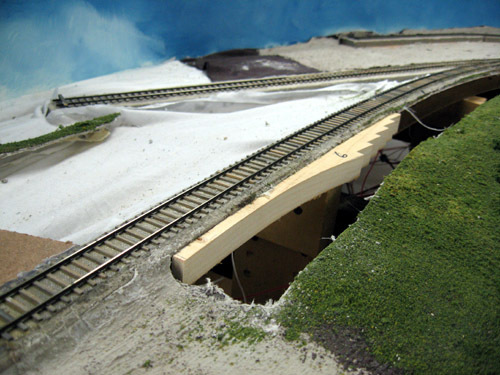 When I was done here, the track was level across and a consistent grade down off the main and into the siding. The locos now run nicely across this section too. I’ll come through later with some profile-cut ties that will slide under the rails and build up the bed in between the spiked rails, and then I’ll stain the ties and ballast this section. That probably will happen when I put in the missing passing siding this fall. My last project for the evening was fixing a broken point rail on a turnout in Georgetown. This only took a couple of minutes, but by then it was dinnertime and I had to call it quits for the night. But I was very glad to have fixed some of the worst problems we ran into and hopefully the yard will run a lot smoother the next time we run it. I managed to get a lot done this weekend. I completed the wiring of the Operator’s panel by hooking up the power supply permanently and adding in the fast clock circuit. It isn’t pretty but it runs, and my operator should be able to control all the fast clocks and train order boards around the layout. I’ll finish the case later to cover up the jumble of wiring. Eventually I have to stick a phone circuit in there too so I’m not in a hurry to get that done yet. I finished up the last seven of the twelve new gondolas and put them on the layout. I had the same problem Tom did with the screws busting through the top of the model, so I ended up grinding down a bunch of ¼” 2-56 screws to about 3/16” so they would fit. Naturally when this task was done I discovered I actually had 2-56 x 3/16” screws all along. Grrr…. These models still need to be weighted but there’s no time to do it now. I think they will be OK for the session; I’ll hunt them down afterwards and finish weighting them when I put on the brake wheels. I also completed several other lesser tasks that I wanted to have done before the Op session. I wired up and mounted a switch to control the Tortoise machine at the entrance into staging, I mounted a number of binder clips to the fascia at all the stations to hold copies of train orders, re-mounted the power supply we thought was faulty, and spent a lot of time cleaning up the basement. I’d say I’m about half done with that, I will be spending more time on it over the next couple of days. 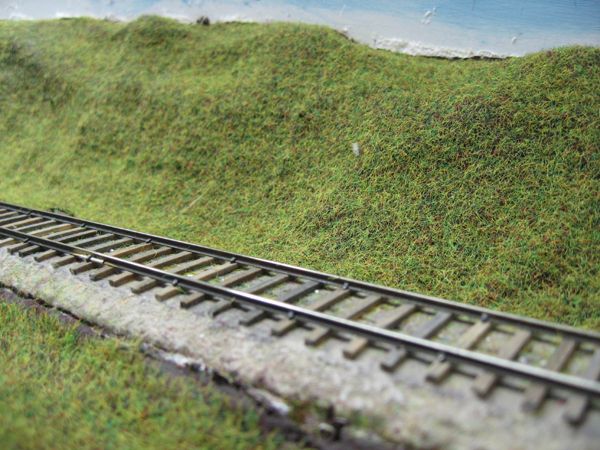 I’ve also restaged about a third of the layout and will finish that job before Friday as well. I just need to finish up one last turnout under Dock Yard to get everything working and we should be all ready to go. Hopefully I’ll have a good crew on Wednesday to help clean track and polish things up a bit. A disappointing work session tonight, 10 days before the next Op session and only two guys showed up. Guess I'll be working hard this weekend on getting things set up for the 17th. Tom arrived and right away we started looking for the throttle bus problem we experienced two weeks ago. He went around the layout testing all the throttle plug-in panels, and we determined that all the Wilson Point panels and the Standard Oil panel were dead. Since the last working panel on that line was at Dock Yard, the problem had to be somewhere between those two locations. A few minutes later we found the answer - a loose connector under Standard Oil. We plugged it back in and everything started working again. Phew! 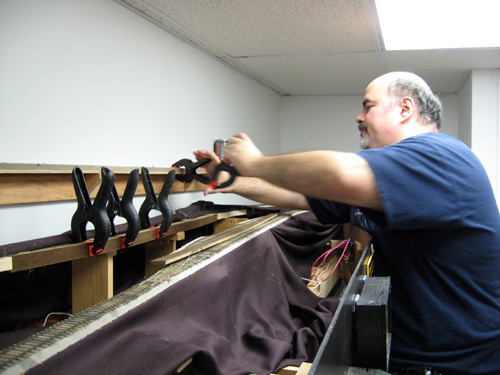 After that Tom got started on attaching couplers and trucks to the new gondolas. All in all Tom got five of the twelve cars ready to run, in spite of some issues with the screw lengths he ran into. I'll finish up the rest in a few days. The car cards and waybills are already made up so they are ready to go once assembled. While Tom did that, I got to work hunting down a short that was causing the auxiliary power supply for the DCC command bus to stop working. It took about 15 minutes but I managed to track it down to a bare wire touching the case of a 1/8" plug plugged into one of the throttle panels. A bit of electrical tape around it and I was back in business. While I was doing that Neil arrived, and I was glad to see him. 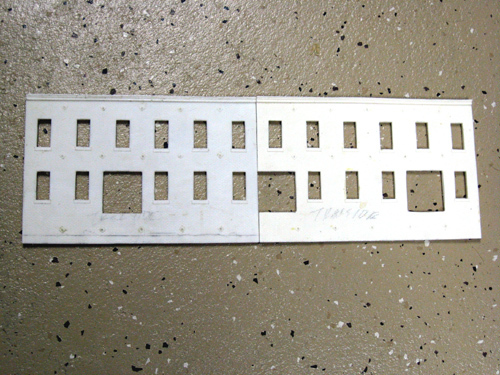 For starters, I gave him the modesty panels Mike Sicurella had cut out for me for the train order and fast clock panels to install. He quickly went through them and got them all put in; they look really good now. I was still doing electrical stuff, I pulled apart the old project box that held the fast clock controller board the other night, and was salvaging some switches from it for use in the new operator's control panel and for a new panel in staging (controlling a tortoise motor in staging). Then Neil and I got to work on the last couple of turnouts in Dock Yard. Well, really the only remaining one that matters. We installed a Blue Point switch machine because of clearance issues and spent a couple of hours trying to make it work. 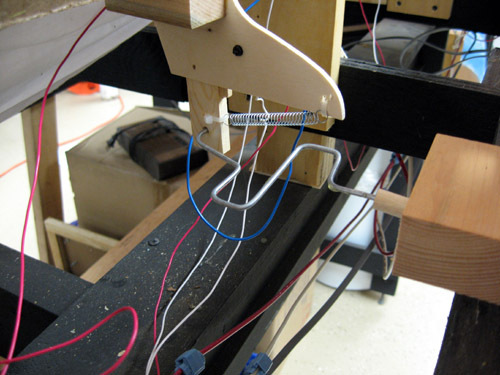 We drilled, filed, bent wires and mounted dowel guides, but could not get it to work well. The biggest problem was the linkage mounting for the Blue Point was far above the barrel bolt, so we could not get a solid push action without the pushrod bending and taking up the tension. We also had some issues trying to mount the return spring that would make the Blue Point work with my barrel bolt controls. We quit around 11 pm, tired and frustrated, but with a plan to construct a bellcrank mechanism to straighten out the push/pull motion from the barrel bolt. I will give that a try in the next couple of days prove out the concept. I have a lot of work to do this weekend. This week hasn't been as productive as I would have liked it to be. I got distracted a lot, tasks took longer than expected and as usual layout time flies by all too quickly. Still I did get some things done. 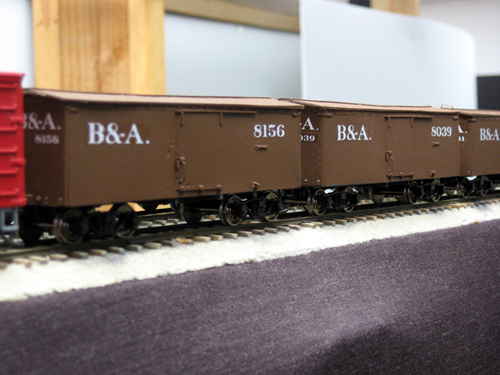 I mentioned last week that after the NY&NE boxcars, one of my big projects to finish up would be the coal gondolas. And that's pretty much where I spent my time since this past week. I had already gotten eight one-piece 34' resin gondolas puttied up (thanks to Wayne) and decided I would go for broke - I spent a day scouring the basement looking for parts to build as many 28' gons as I could. After over four years since they were cast there were parts scattered everywhere. I eventually turned up enough bits and bobs to build five more cars. A few needed a little extra TLC to get them to work, and one kind of got kitbashed from other gon kit parts to finish it. But in the end I had twelve new gondolas to add to the fleet by Thursday. Friday I spent the day starting to detail these cars. Needlebeams got installed underneath, and then the queenposts. Unfortunately I got through five of them and learned I was out of queenposts! I thought I had a huge stockpile of them but it turns out I must have been using them at a prodigious rate, and I ran out. I did find one bag of Grandt Line queenposts which got me through two more 34' cars, but I could not finish the eighth. Oh well. I ordered a bunch more from Tichy Train Group (along with some more brake wheel kits and other bits) and decided to move on. Fortunately I did have a good stockpile of .015" bronze wire and turnbuckles, so I was able to put truss rods on all the cars by Friday night. Fortunately the 28' cars do not need queenposts or turnbuckles. I cleaned the cars with dish detergent and lots of water after that, and when dry I painted them with black auto primer. This was followed by a coat of gloss enamel, both sprayed from aerosol cans. No airbrushing for these workaday cars! When the gloss paint was dry enough I started putting on the decals. Decaling took much longer than I expected, almost 7 hours! I had hoped to get these finished on Sunday, but I went to bed when the decaling was done. Monday I finally had the chance to shoot the models with a coat of clear acrylic matte paint. Unfortunately it was about 90* and 100% humidity when I did it, so it was uncomfortable. But, the humidity seems to have given the cars an interesting, faded looking finish. I have heard of this 'blushing' effect before, and though it was an accident I think it turned out great. Similar to the look of Mike Rose's alcohol on dullcote method but very subtle. Looks like sun-faded paint turning to a dark gray. I'm hoping that I can get one of my friends to help install the trucks and couplers on these cars this Wednesday during the work session. The holes for the mountings are already drilled and tapped. I've even made up the car cards for them, they just need to be finished, added to the layout and billed and they are ready to go. They will all get their brakes staffs after the Op session. I also need to find a better way of putting some weight in these cars than filling the underframe with steel BB's. That works, but it's very time consuming. I'd really like to find some of that lead sheet I have heard about (but have not been able to find).